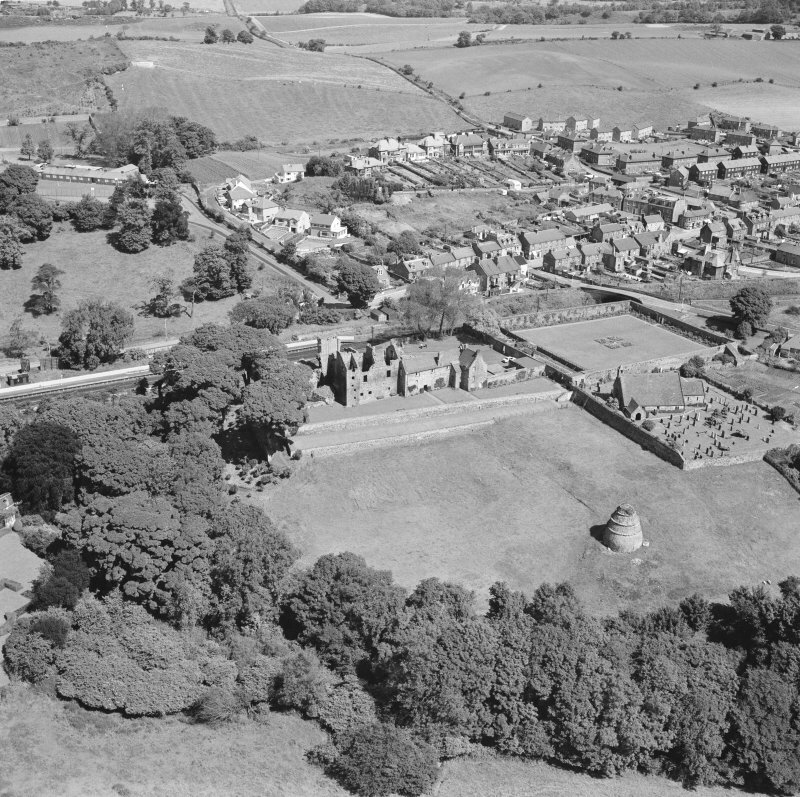 Oblique aerial view centred on the remains of the castle, dovecot and walled garden and the church and burial-ground, taken from the SE. 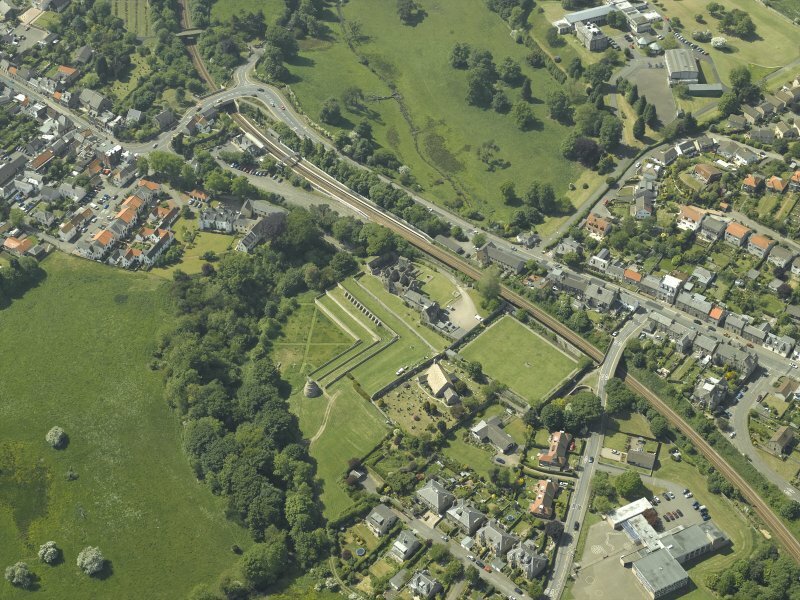 Oblique aerial view centred on the remains of the castle, dovecot and walled garden and the church and burial-ground, taken from the SSW. 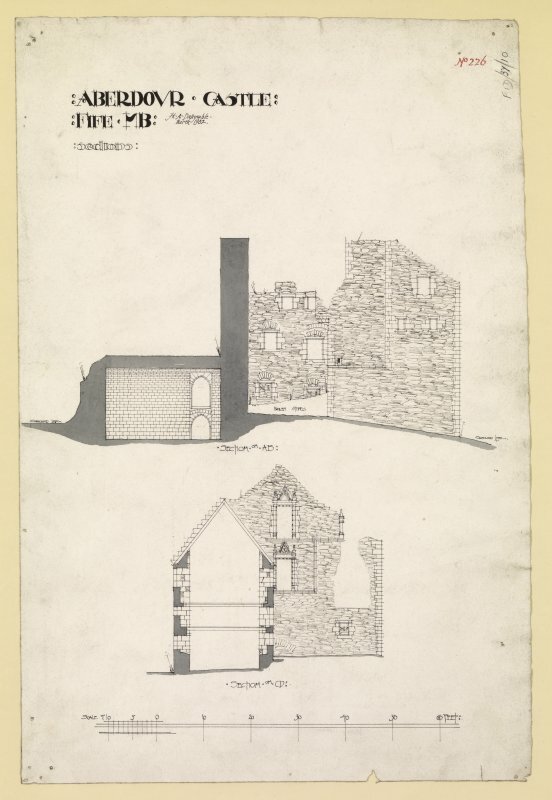 Longditudinal section through keep and transverse section through south block of Aberdour Castle. 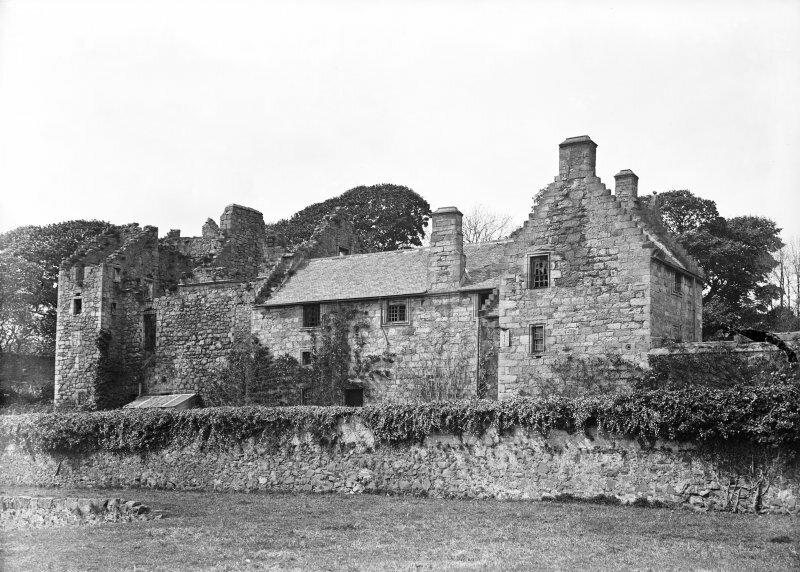 General view of South elevation of Aberdour Castle with people in foreground. 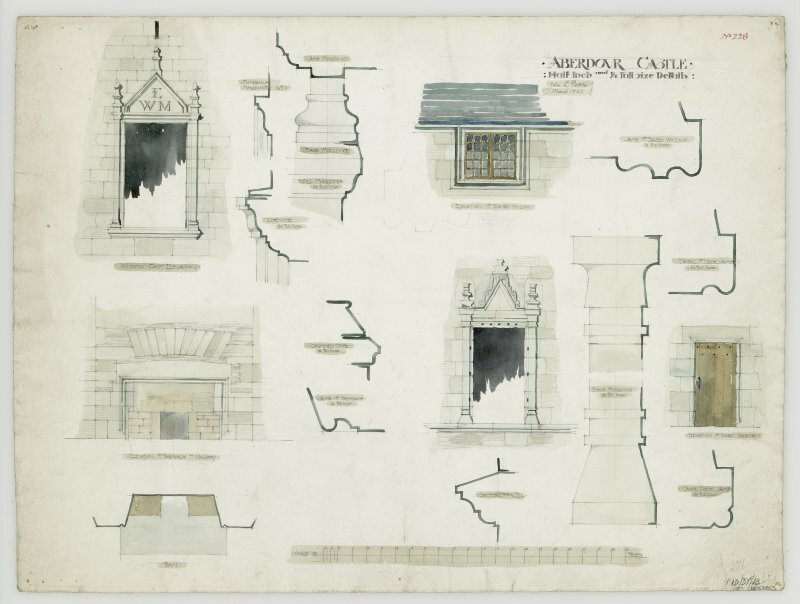 Drawing showing details of doorways in garden wall, fireplace in gallery and window details. 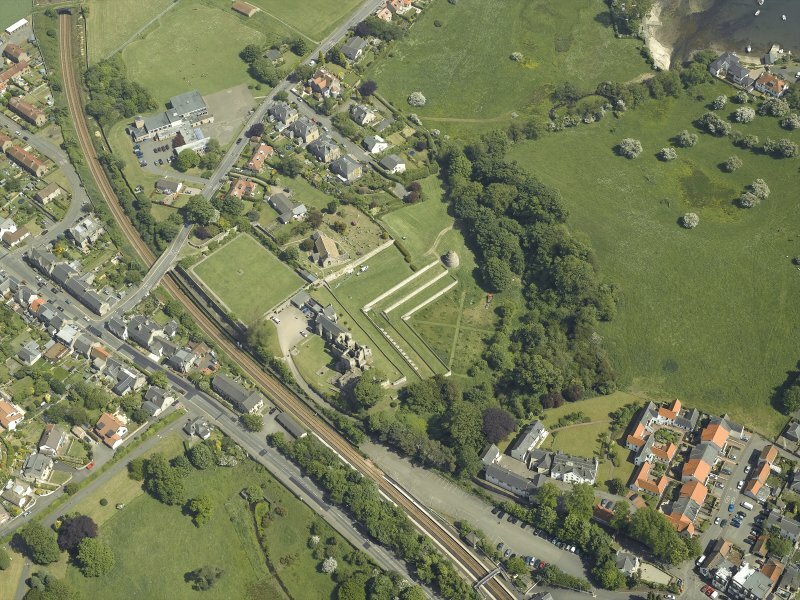 Oblique aerial view centred on the remains of the castle, dovecot and walled garden and the church and burial-ground, taken from the ESE. 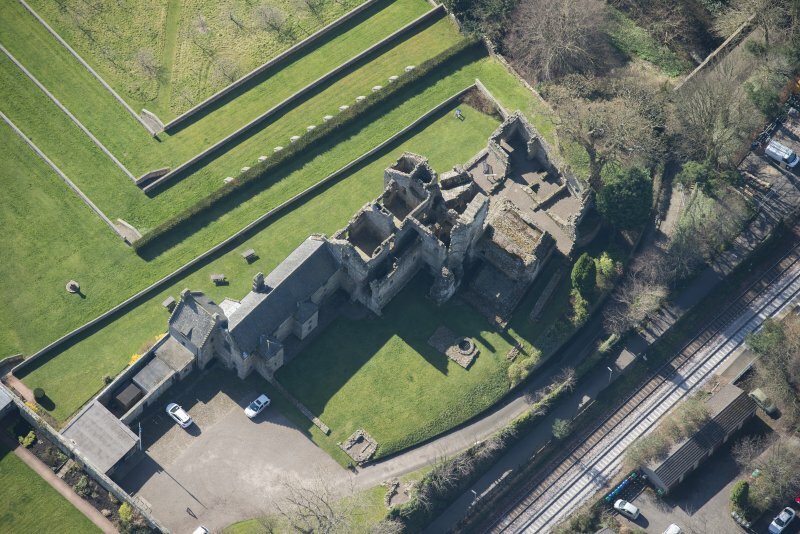 View of architectural survey of Aberdour Castle. 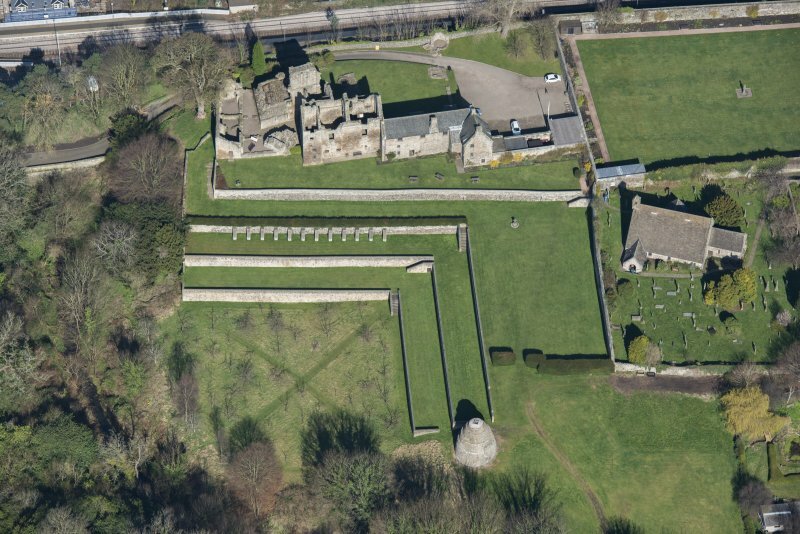 Oblique aerial view centred on the remains of the castle, dovecot and walled garden and the church and burial-ground, taken from the W.
Upper floor plan of Aberdour Castle. 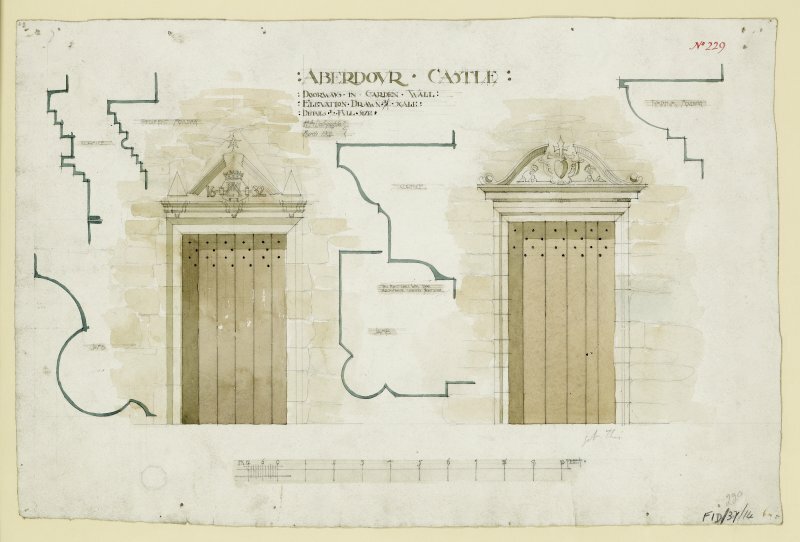 Details and elevation of doorways in garden wall at Aberdour Castle. 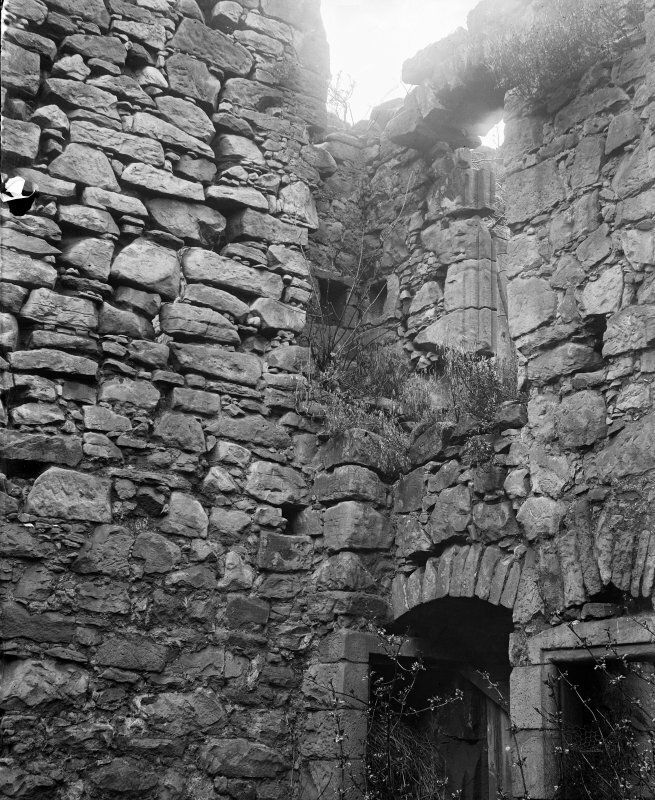 Details, elevations and sections of windows, turret doorway and terrace in gallery at Aberdour Castle. 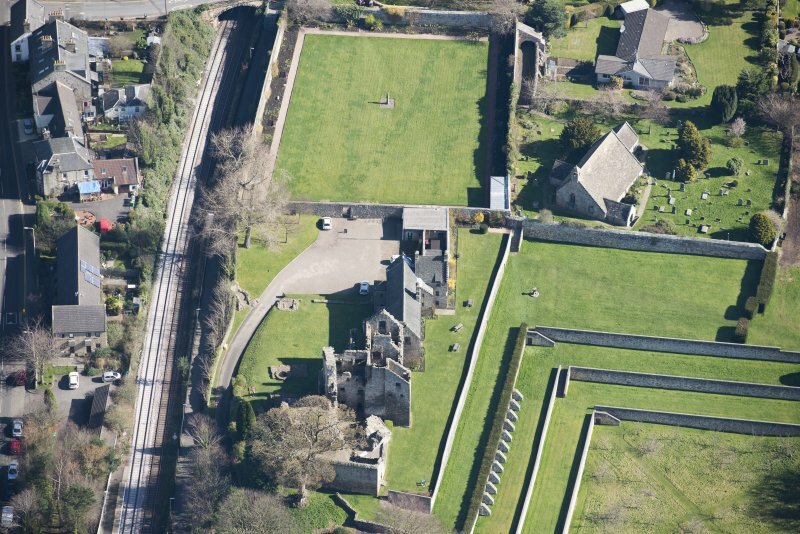 Oblique aerial view centred on the remains of the castle, dovecot and walled garden and the church and burial-ground, taken from the S.
Oblique aerial view centred on the remains of the castle, dovecot and walled garden and the church and burial-ground, taken from the NW. 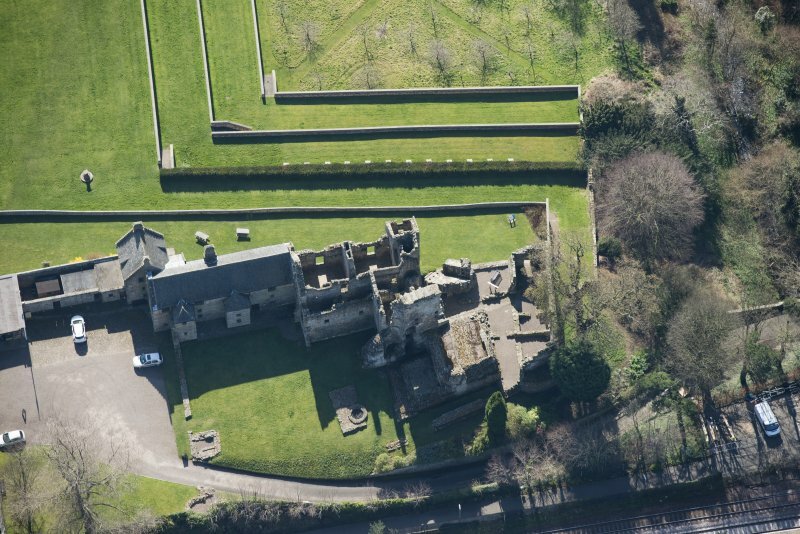 Aberdour Castle, which is under guardianship, is fully described in the attached guide. The remains are in an excellent state of preservation. A broken semicircular enamelled copper alloy ornament was discovered during MoW excavations in the 1950's. NT 1924 8547. 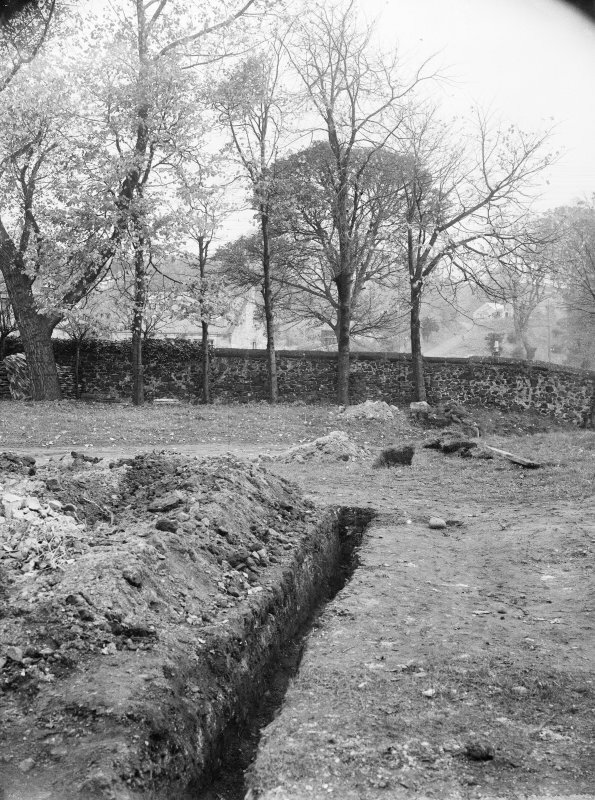 The excavation of inspection pits in advance of wall stabilising measures was monitored by Kirkdale Archaeology on the N terraces of the 16th and 17th-century garden layout. The terraces comprised massive dumps of humic earth, with evidence for the method of terrace construction in the form of tip lines, suggesting that the terraces and their retaining walls were raised concurrently. 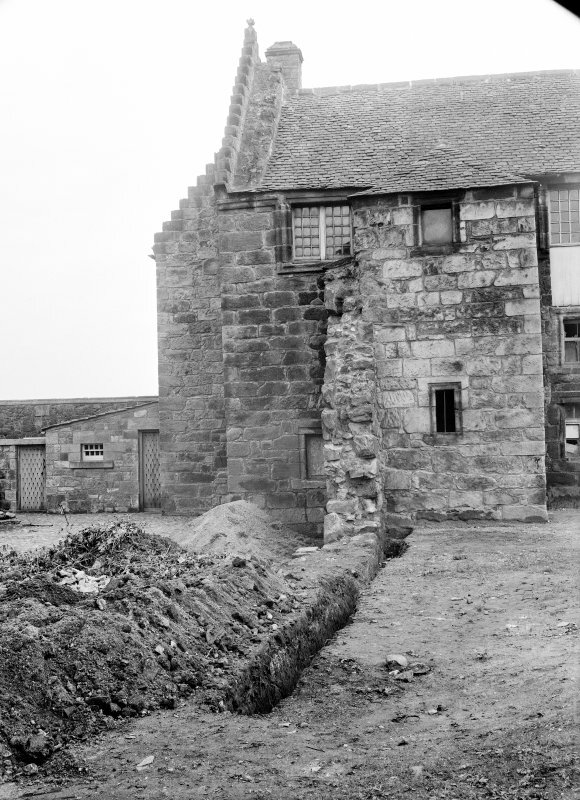 A further trench was excavated on the S side of the doocot, where evidence for modern stabilising measures was revealed, in the form of a massive concrete support around the base of the wall. 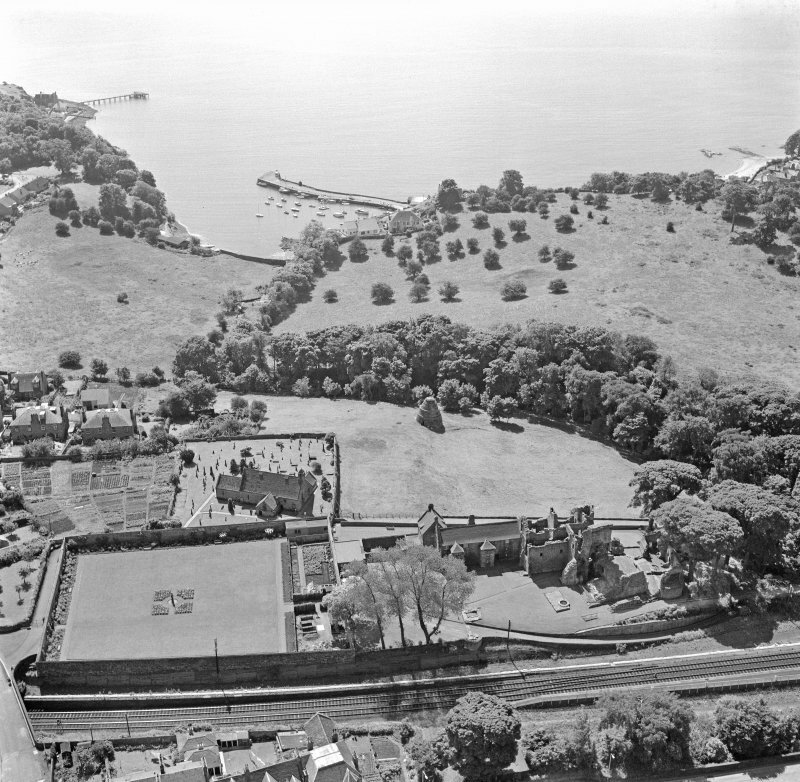 NT 1924 8547 A short programme of excavation was carried out during early 1999 on the terraces situated against the S side of Aberdour Castle. 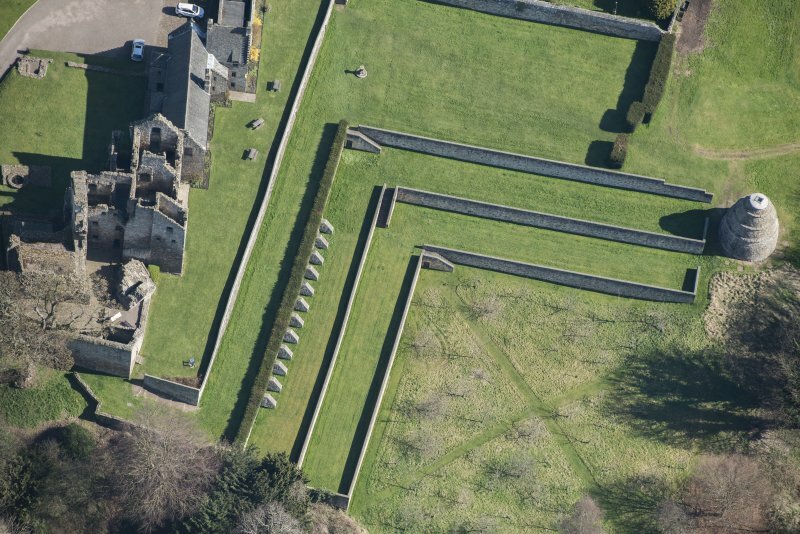 Detailed evidence was recorded of the sequence of alterations to the terraces and 16th-century terrace walls, and various garden features were also encountered. A fuller summary has been lodged with the NMRS. 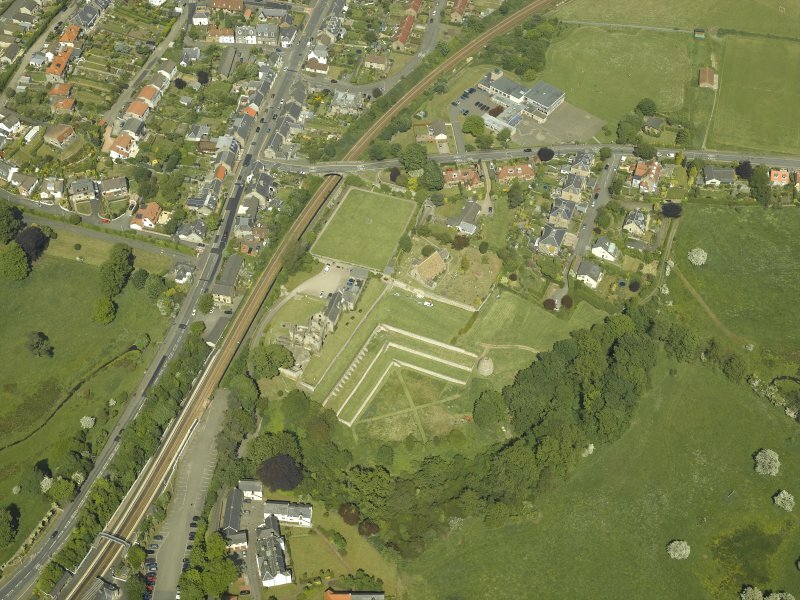 NT 1924 8547 An evaluation in May 2003 comprised the excavation of a series of test pits to assess the impact of planting a protective hedge line on one of the terraces in the gardens. 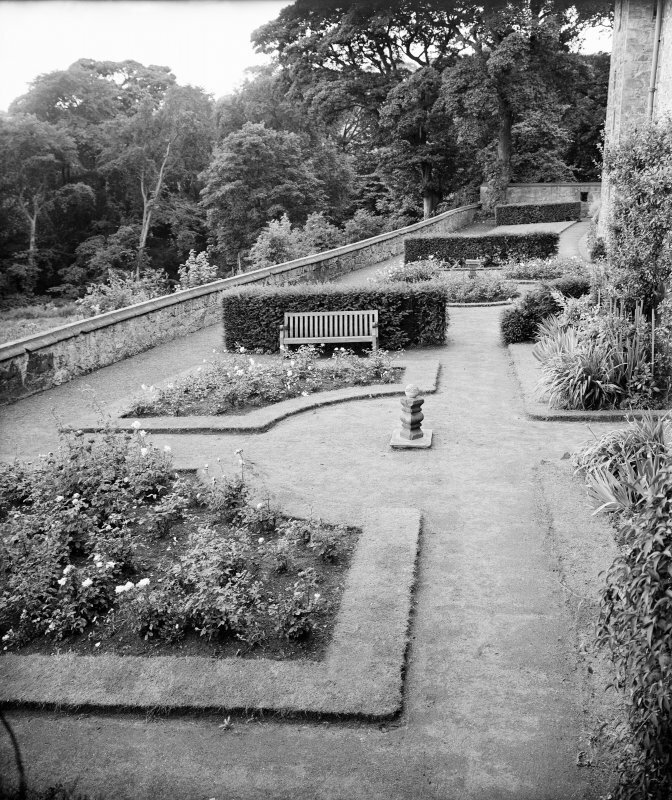 This terrace, the second terrace down from the castle on the N side of the gardens, is one of the last survivors of the original arrangement of seven terraces around the N and W sides of the area to the N of the castle. 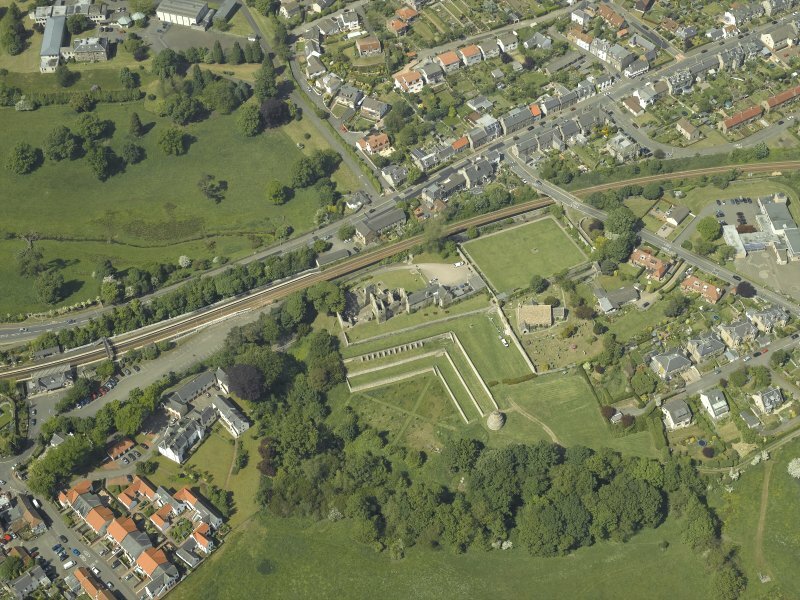 It was shown that excavation up to 500mm was unlikely to disturb significant archaeological remains. 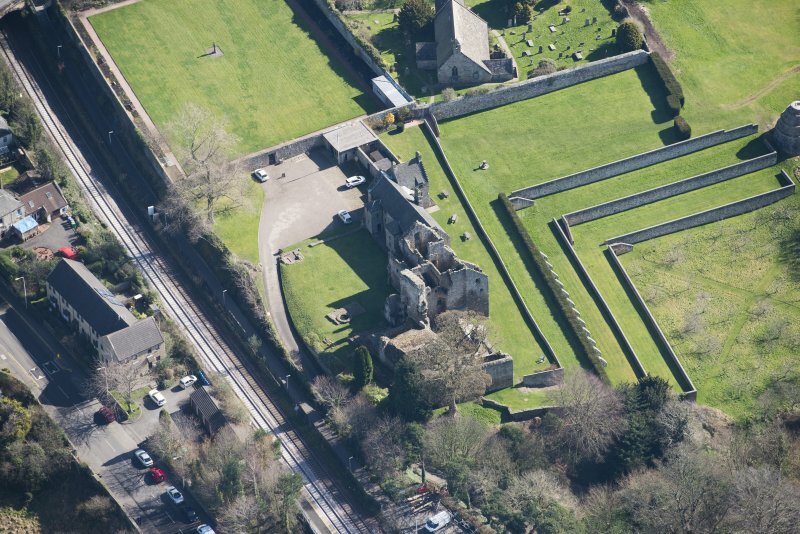 Architect: Master James Smith 1690 - estimate of works to be carried out. 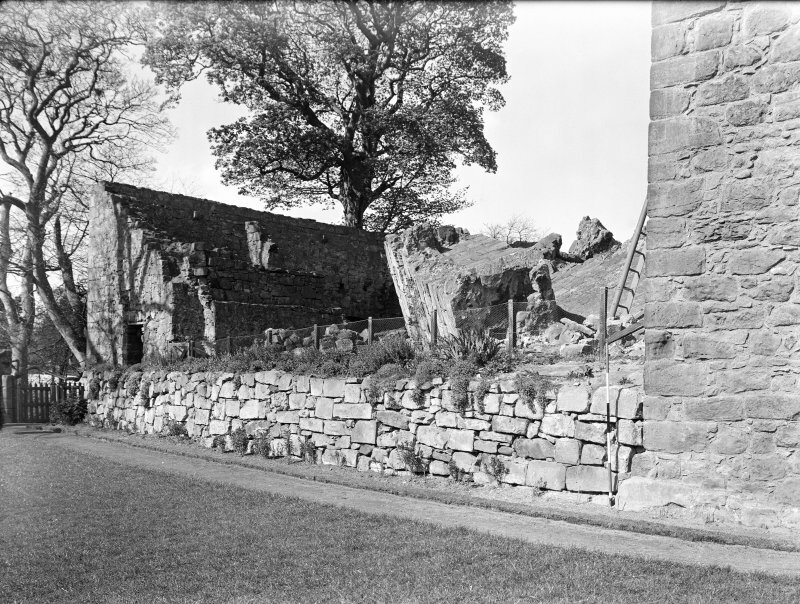 Typescript of research files prepared by Dr M R Apted while the author was an Inspector of Ancient Monuments ( Scotland). Presented by Dr Michael R Apted. 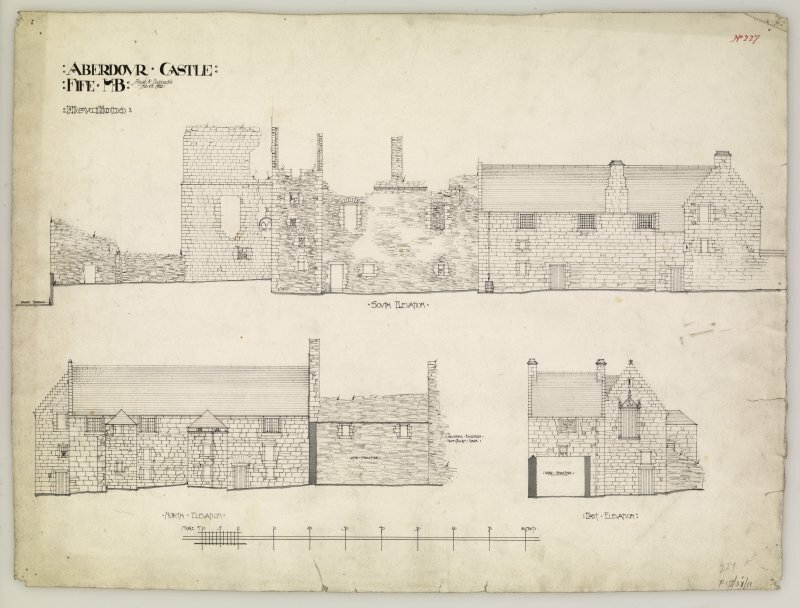 Slaterwork undertaken by James Gib about the Castle of Aberdour. 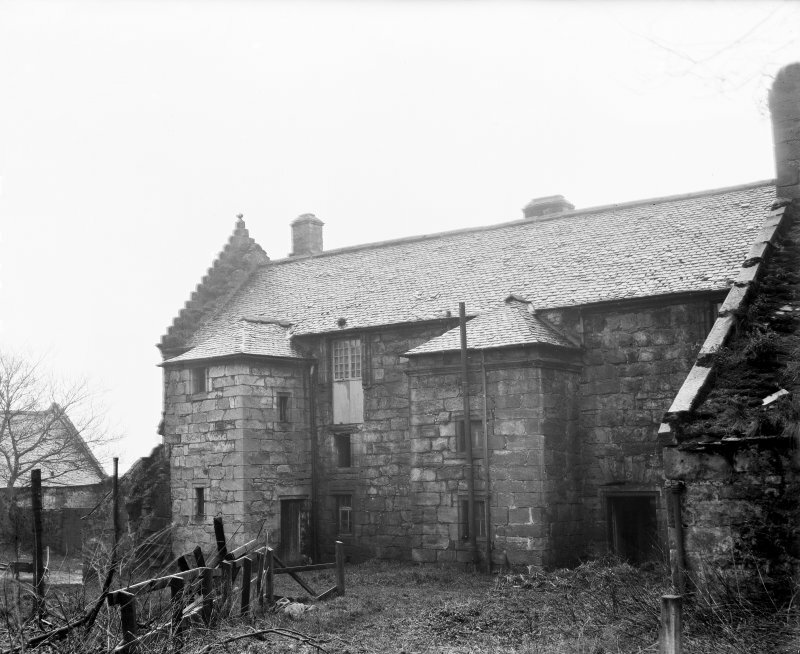 It includes pointing the North side of the Gallery adn the woman house, the two ends of the brewhouse and parts of the washing house. The Earl of Morton is to furnish tools and materials. Payments for deals and slates for Castle and House. (1682-1689). 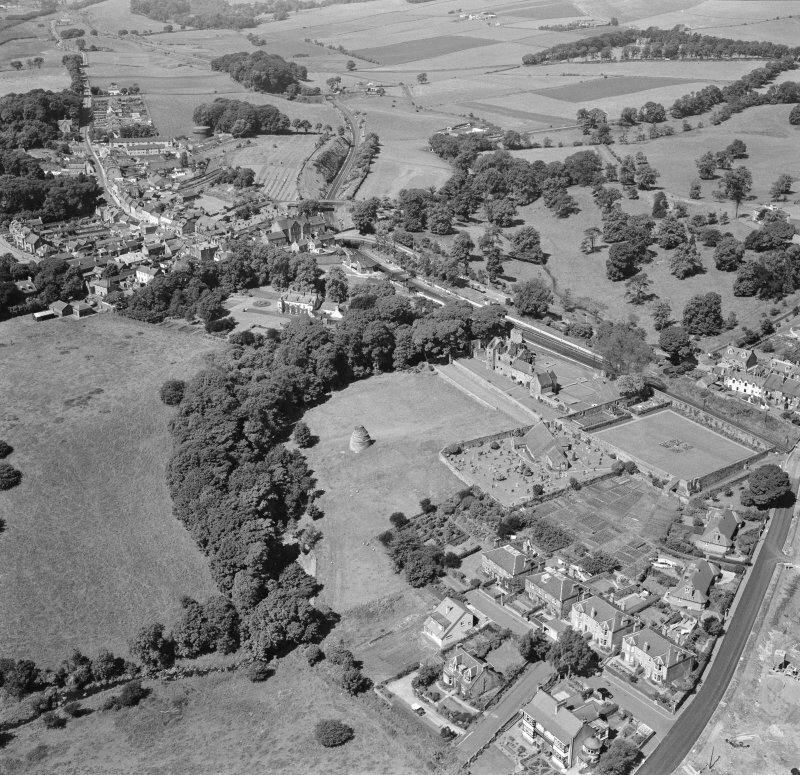 Noted in James Hay's Account of the Earl of Morton's Money'. Letter from Hugh Abercrombie (Chamberlain) to James hay. W S.
Mr Abercrombie has spoken to certain tenants to bring in lime. 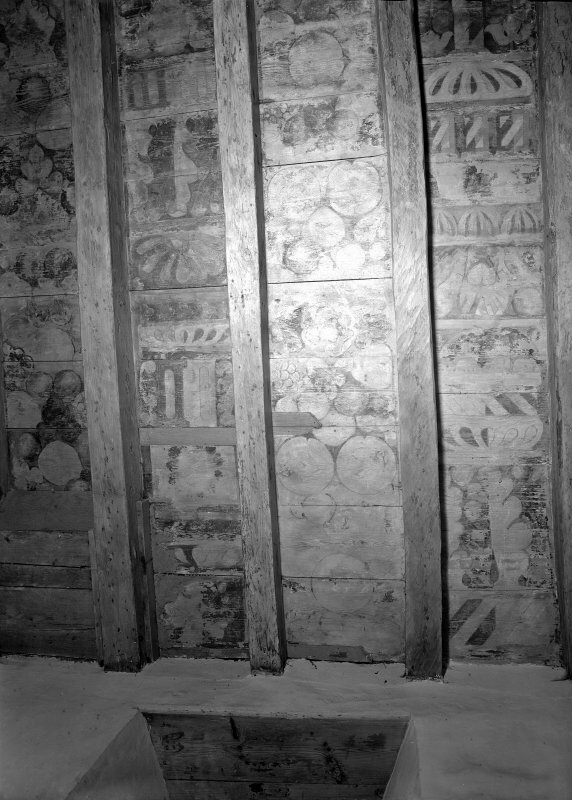 The repairs are necessary so that furnishings will not be spoiled. 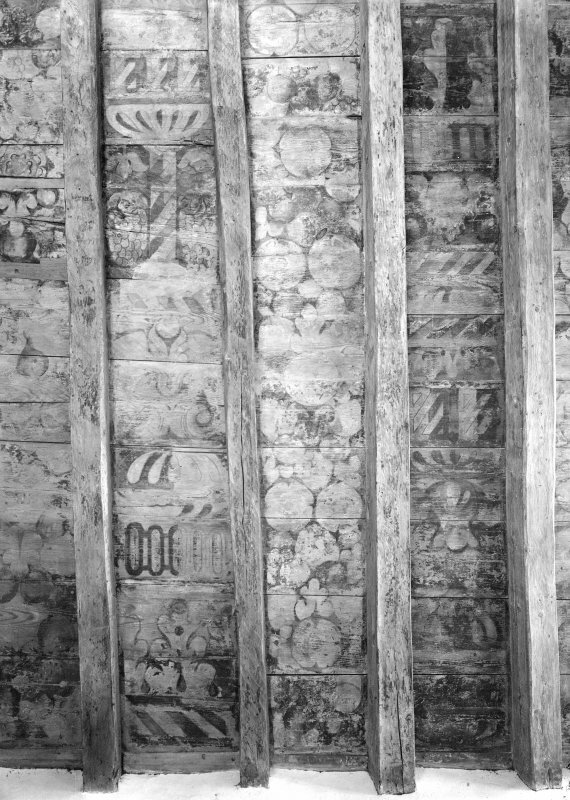 Repair of the roof of the Castle. The Slater and Wright have been consulted. 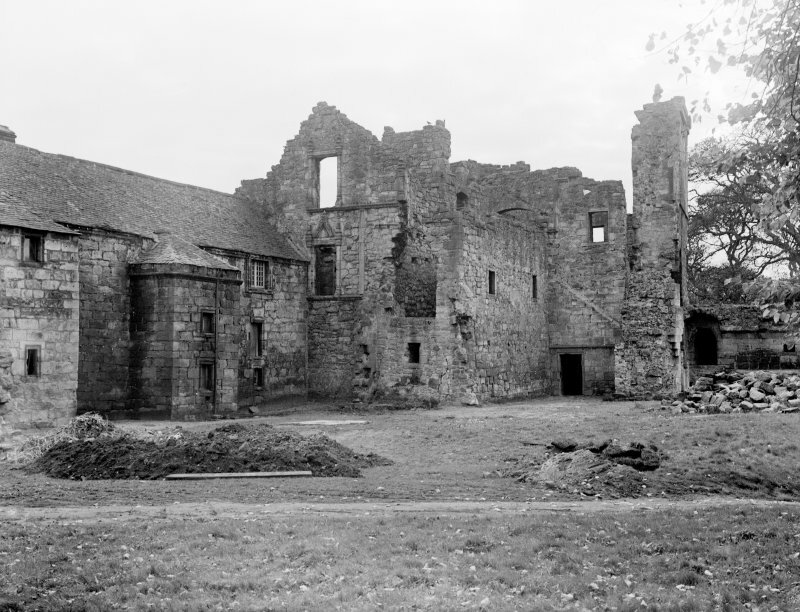 Chrystie suggests that the timber of the old hosue may serve to repair it unless Master Robert Douglas prefers to order new. 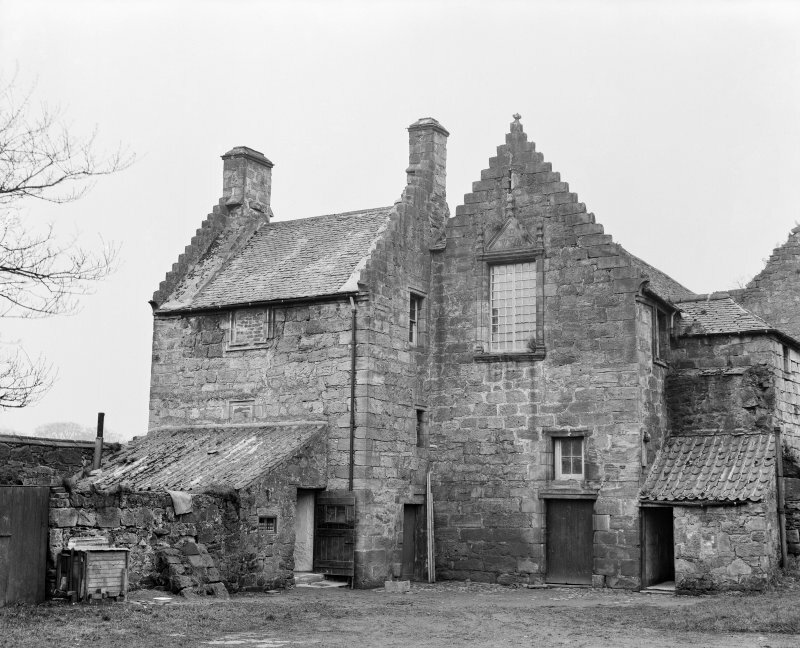 Payment of 3 guineas 'to Master James Smith, mason, for going to Aberdour and his measuring and surveying the house and drawing some draughts of a new house with a particular note of what the charge might be and for his other pains in that affair'. 1690. James Hay's 'Account of the earl of Morton's Money'. 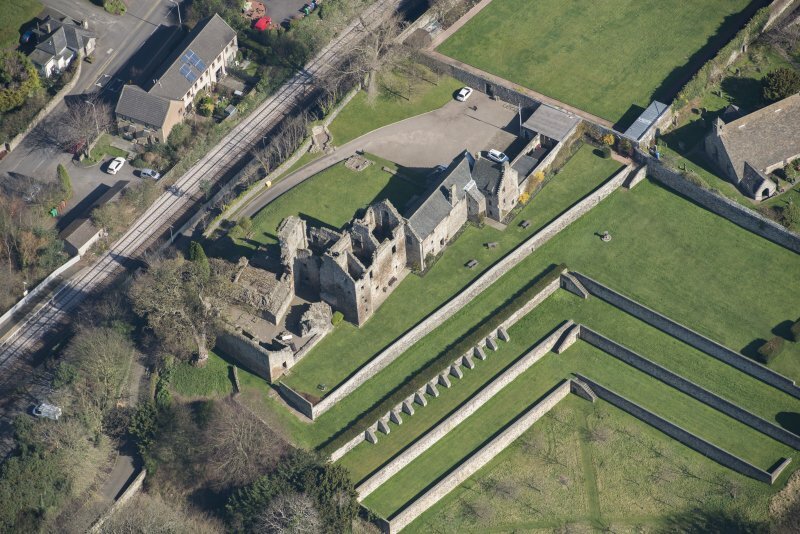 Estimate of work to be carried out on the old part of the House of Aberdour. 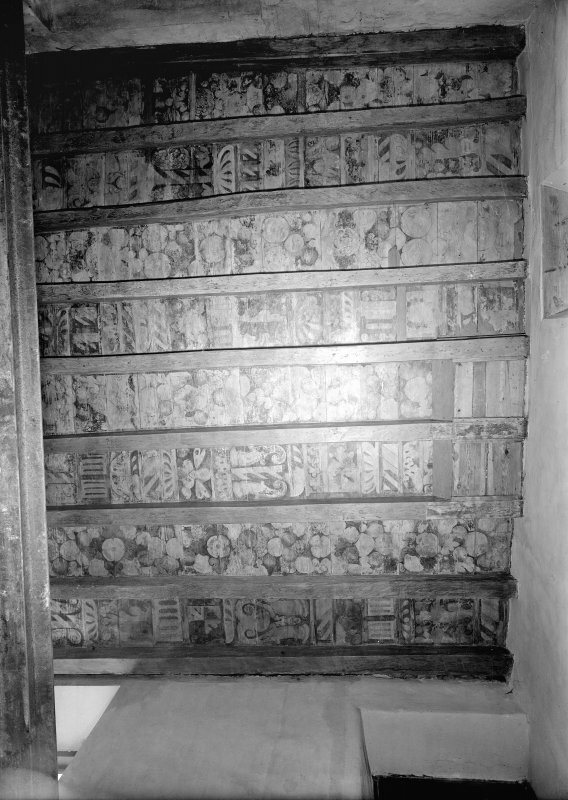 It includes flagging of 40 doors and windows and rebuilding them in proper places and work on outer stair, the pavement walk and the cornice going round the front otthe house. 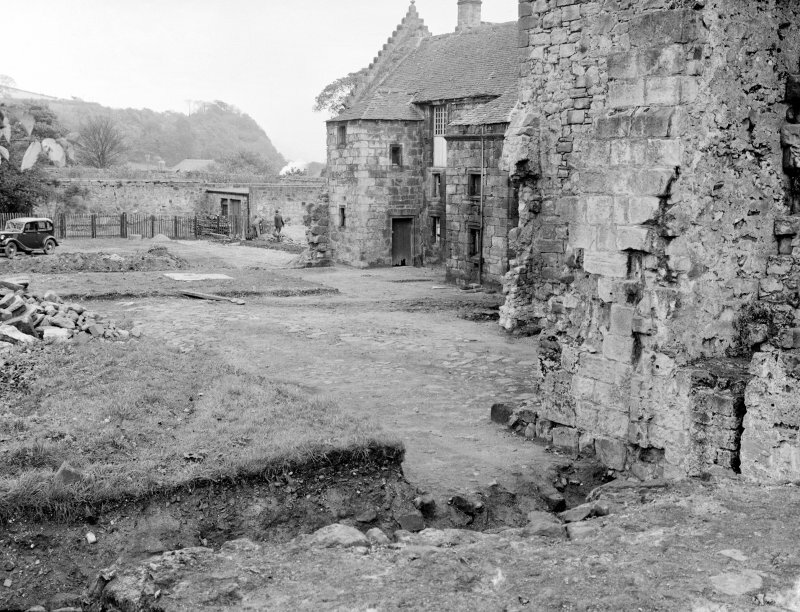 Estimate of the reparations to be made at the House of Aberdour. It includes flagging of 40 doors and windows and rebuilding them in proper places and work on outer stair, the pavement walk and the cornice going round the front ot the house. 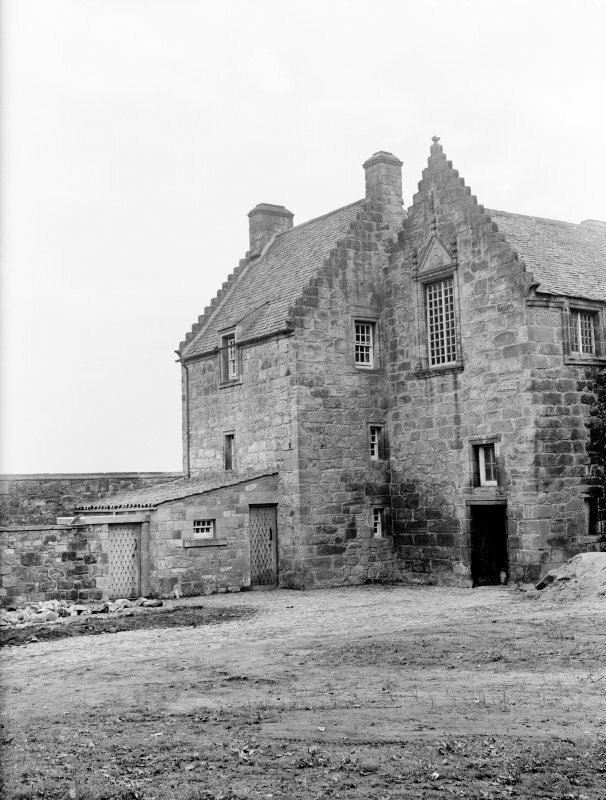 Estimate of the reparations to be made at the House of ABerdour. It includes an addition to the house and improvements to the existing building. The cost is estamated at ?1210 16 4. Addition to the House of Aberdour. 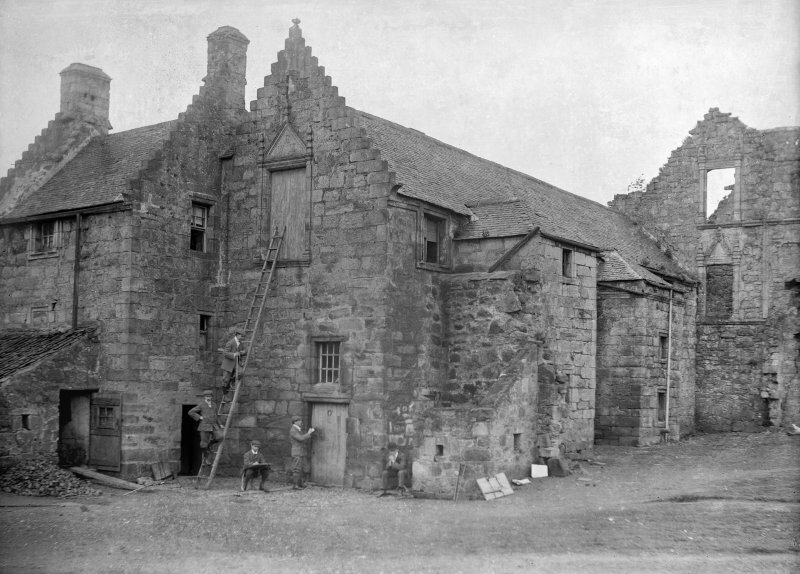 Estimate of the cost, of digging the foundation, of stone for the Back Stairs and Great Stair, and of hewn work for the 17 door and windws on each storey. 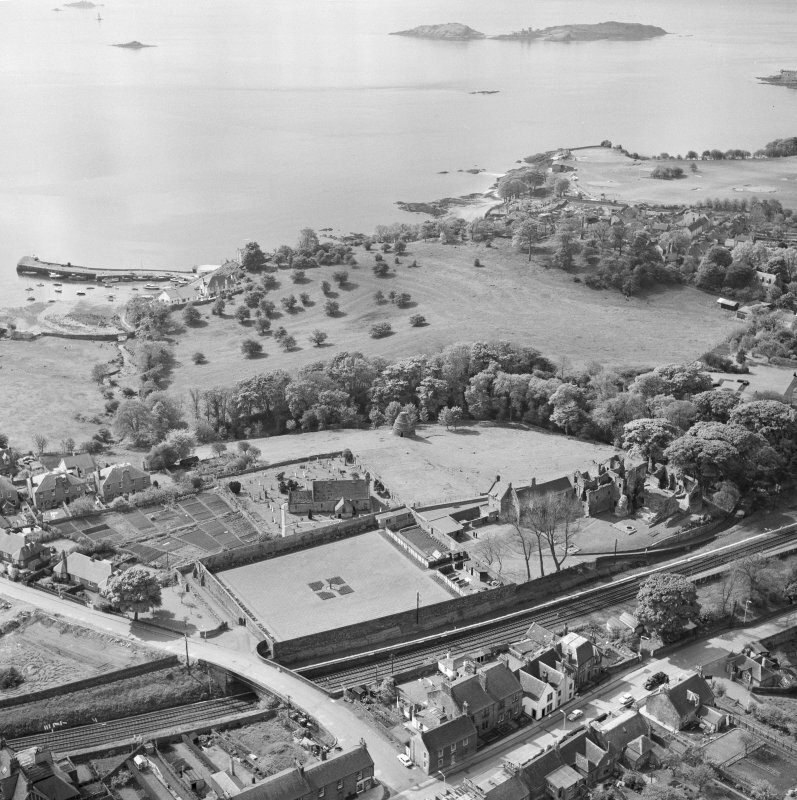 Estimate of the alterations to be made at the House of Aberdour 'The whole length of the gallery to continue, the new adition to be made to the North side of its 28 ells long and the Wester gable is 6 2/3 and the Easter gable 6 2/3 and the great staircase 22 1/3 ells about and the small staricase and buttery 7 1/3 ells wich being accumulate in one the new addition is in the circumference 71 ells and multiplied by 11 which is the height is 781 ells'. 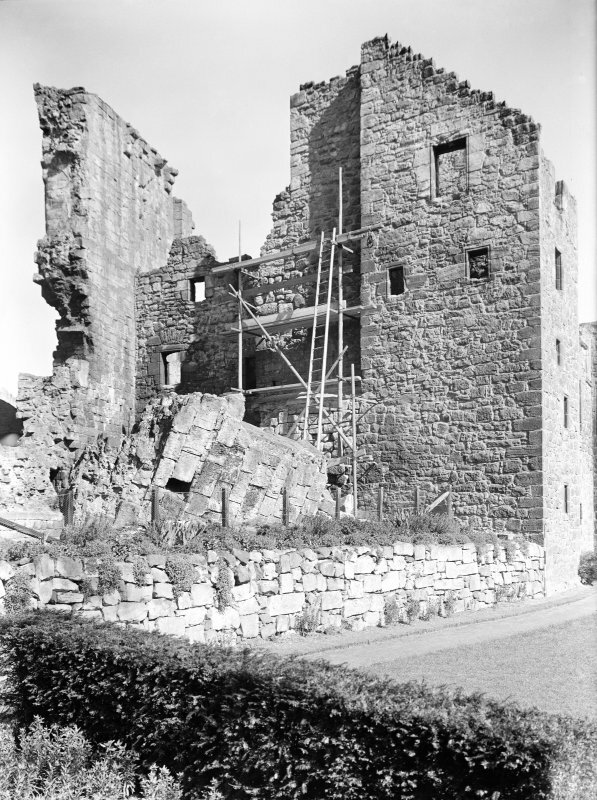 Repair of the Castle of Aberdour. Account of money paid for slater and wright work. 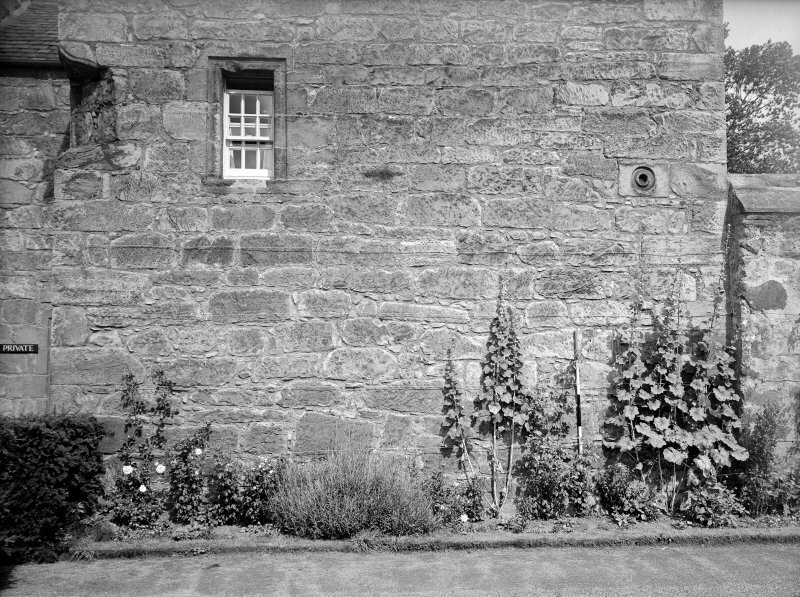 Wright work at the Castle of Aberdour. Account from Thomas Livingston, wright. It includes a sum for working in the gallery. 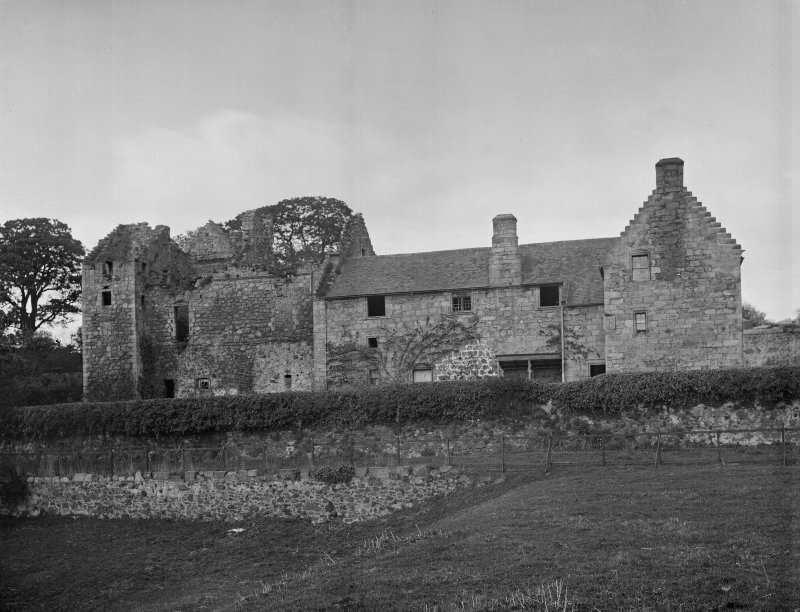 Slater work at the Castle of Aberdour. 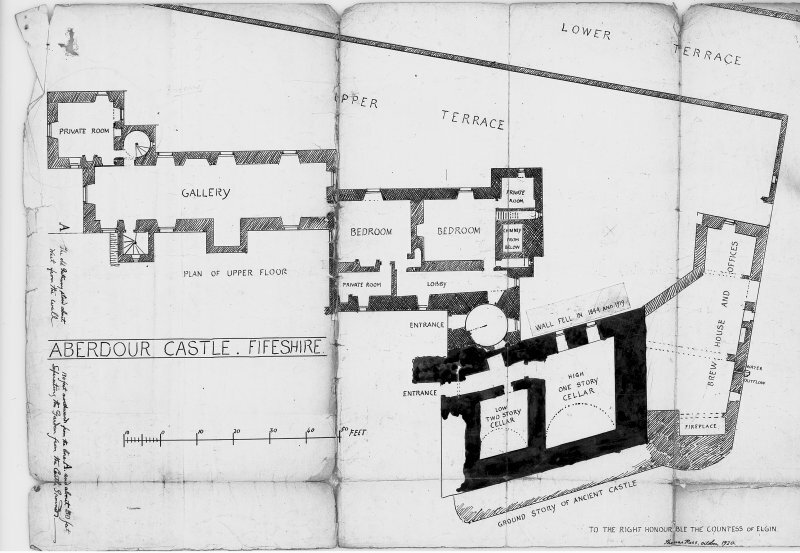 Receipted account from James Gib Slater in Burntisland for 'painting the gallery and chamber square'. 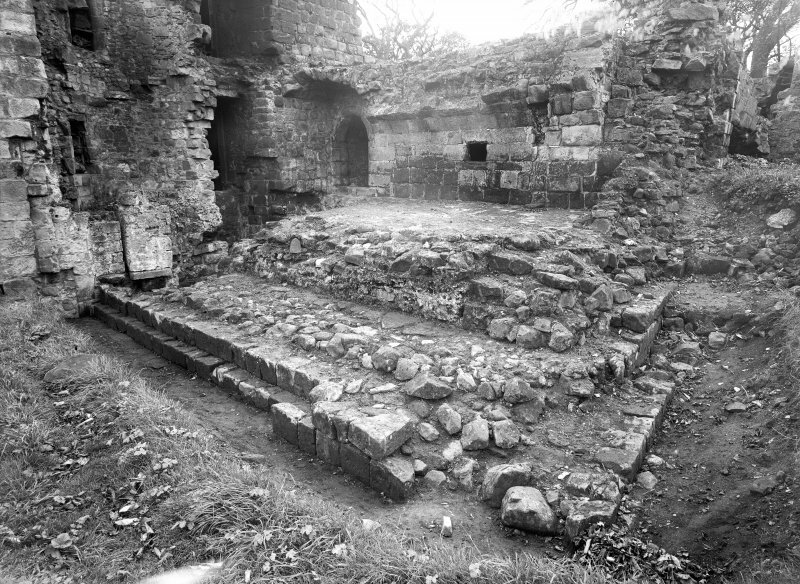 Smith work at the Castle of Aberdour. Account form a chimney of 6 stone 6 pounds in weight, new locks and keys and various items of iron work. mason, Wright and Slater work. 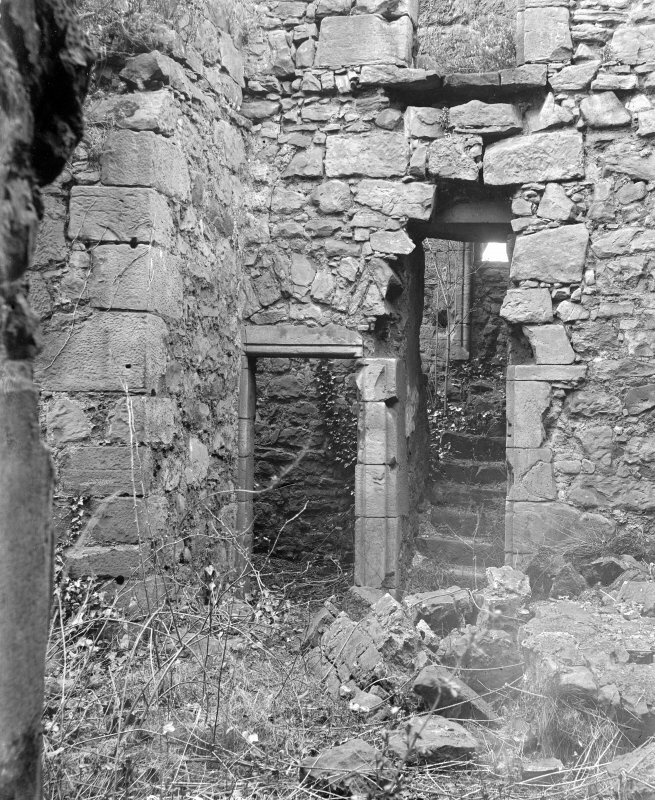 The work includes the quarrying of stone for the gates and the removal of the storm window in the gallery. Receipt from Robert Bennet, Wright at Whitehill for work in the gallery 'making things for observing the eclipse'. 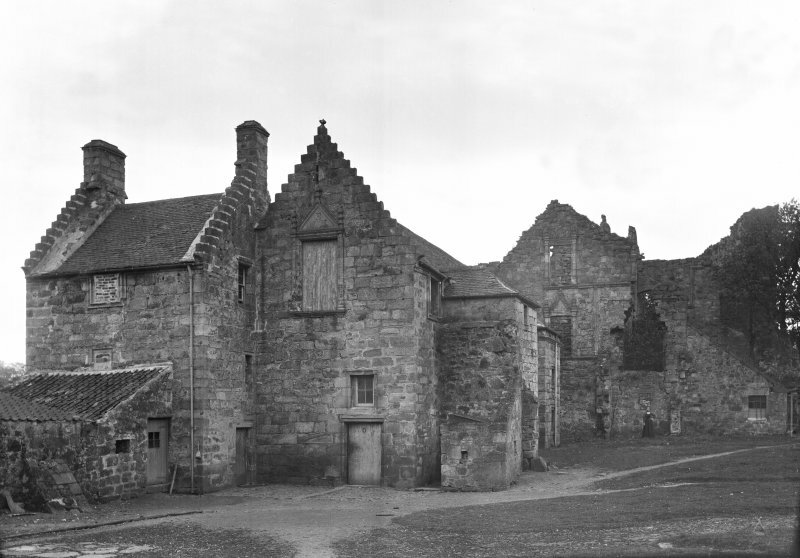 The burning of the Earl of Morton's House of Aberdour. Army officers were lodged there and their servants had put on large fires after washing the rooms. 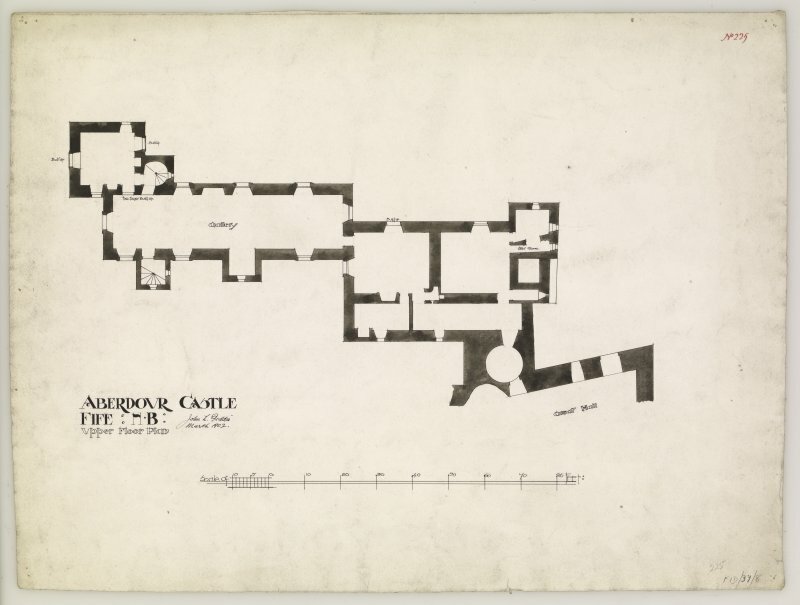 At 5 a.m. fire broke out with great violence in teh room above the Dining room and all the apartments between the gallery and the castle were gutted. 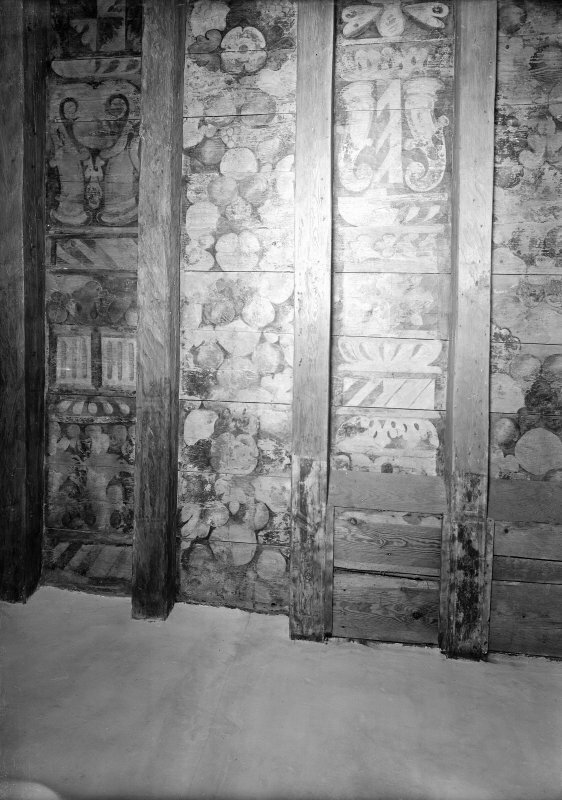 the Gallery was saved by building up the door to the Dining room with stone. 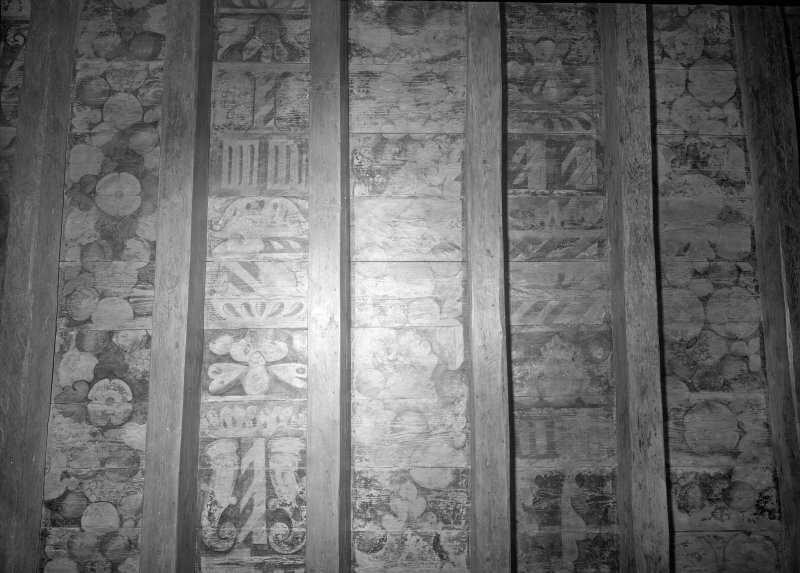 Most of the paintings were destroyed. 'This accident must now push your lordship to build a new house'. Letter. Robert Douglas to the Earl of Morton. 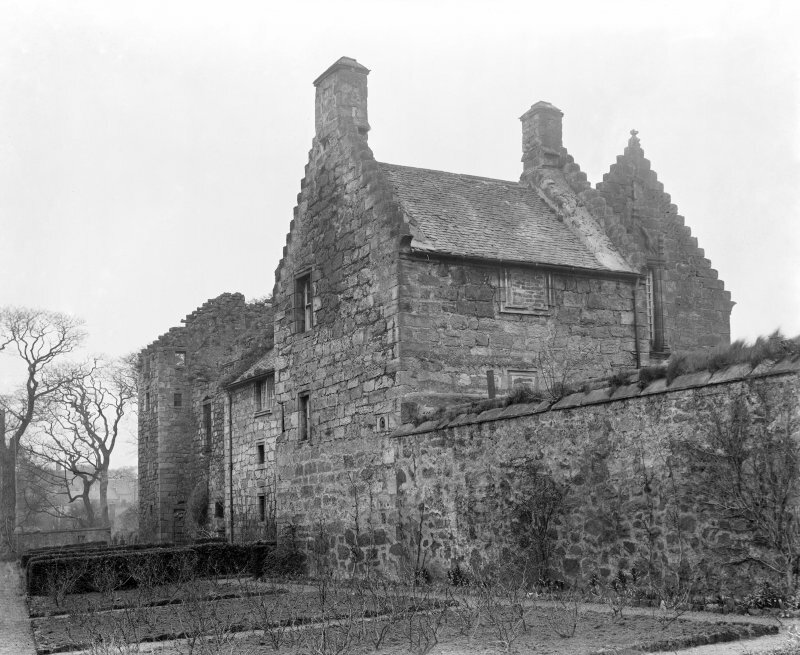 The burning of the House of Aberdour. 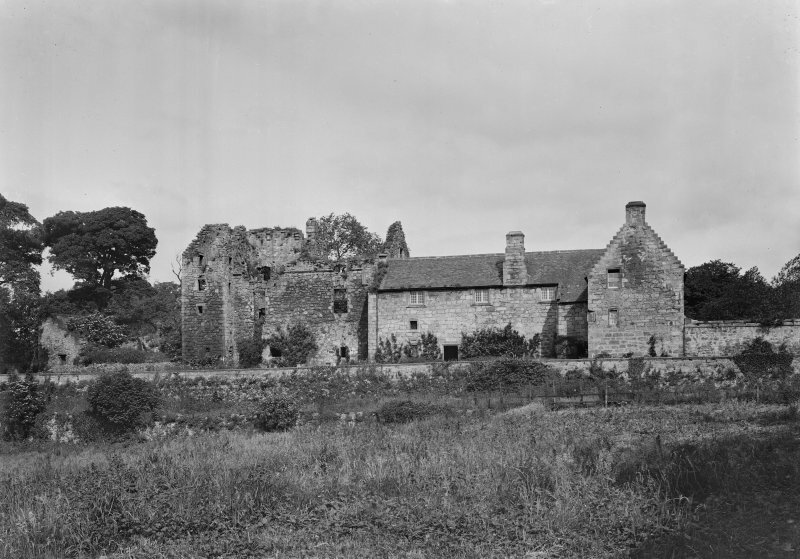 Casued by the carelessness of the servants of the officers billeted there 'most of my old fyne valuable pictures, all the furniture I had and worst of all one of my ancient charters and papers' were lost. The Earl of Morton hopes that the Queen will take his 'deplorable condition under her Royal consideration'. 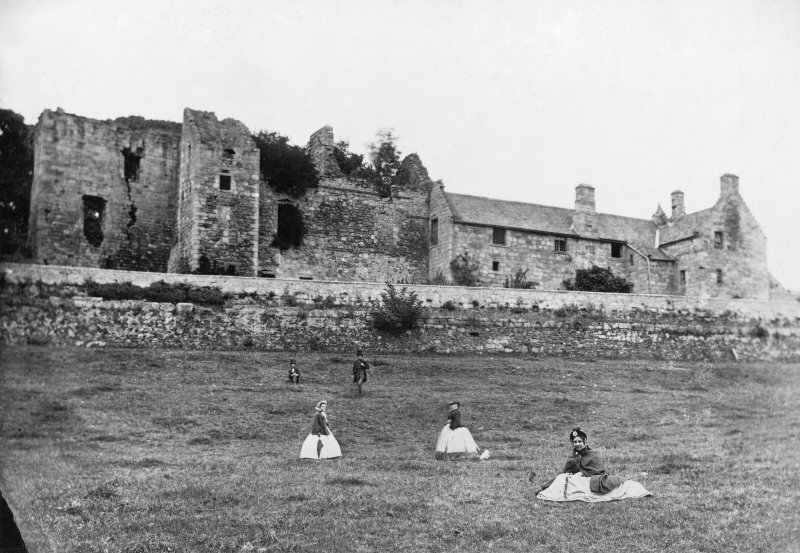 Letter from James 10th Earl of Morton. consideration'. 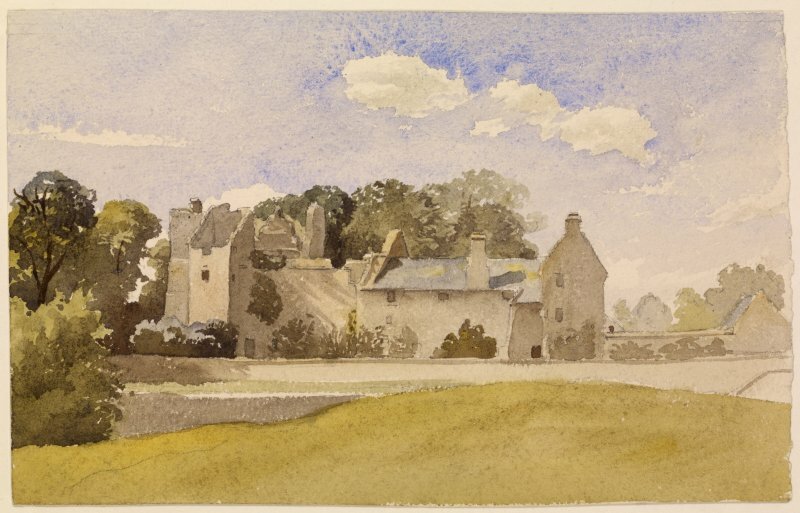 Letter from James 10th Earl of Morton. 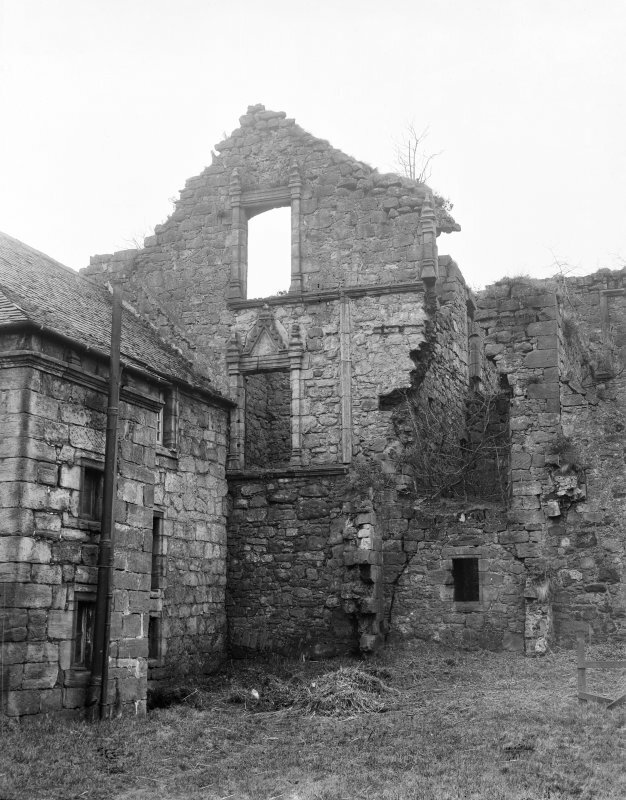 'Surely sooner or later Aberdour will be rebuilt unless some other house fit for the family both for size and situation fall in my lord's way'. 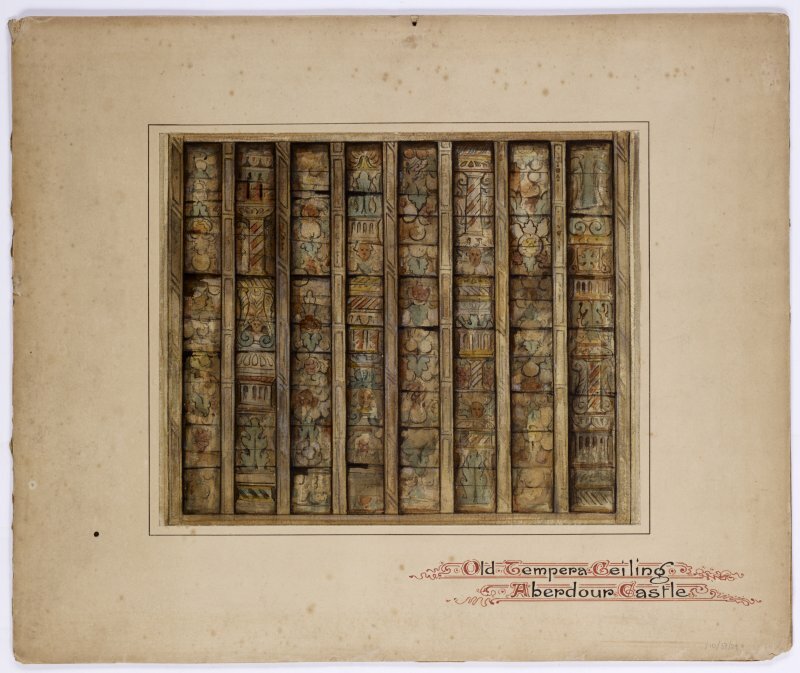 Letter from John Drummond to Lord Aberdour. 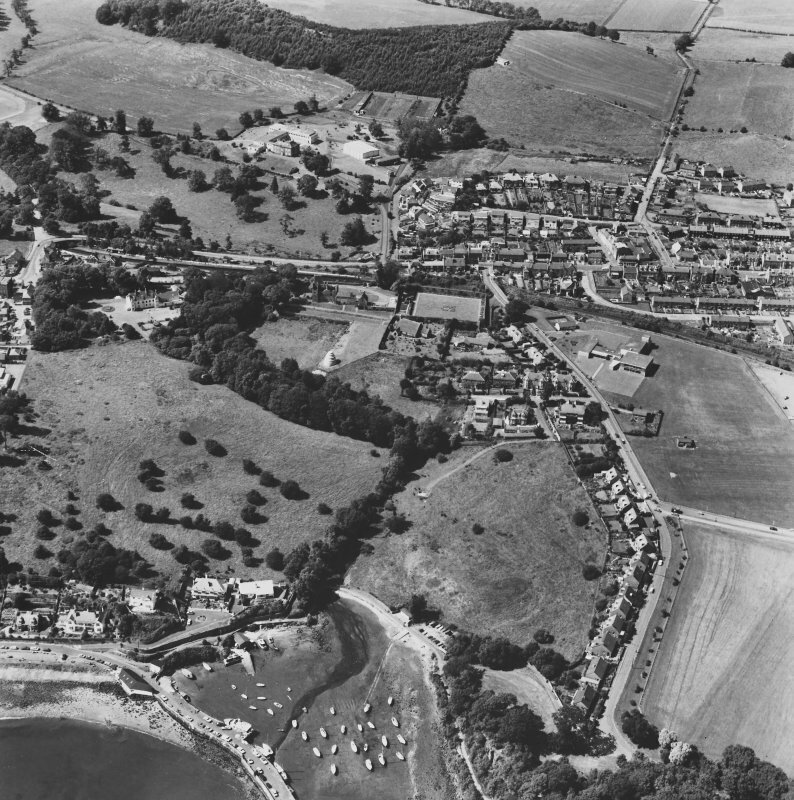 Oblique aerial photographs of Aberdour, FIfe, photographed by John Dewar in 1966. 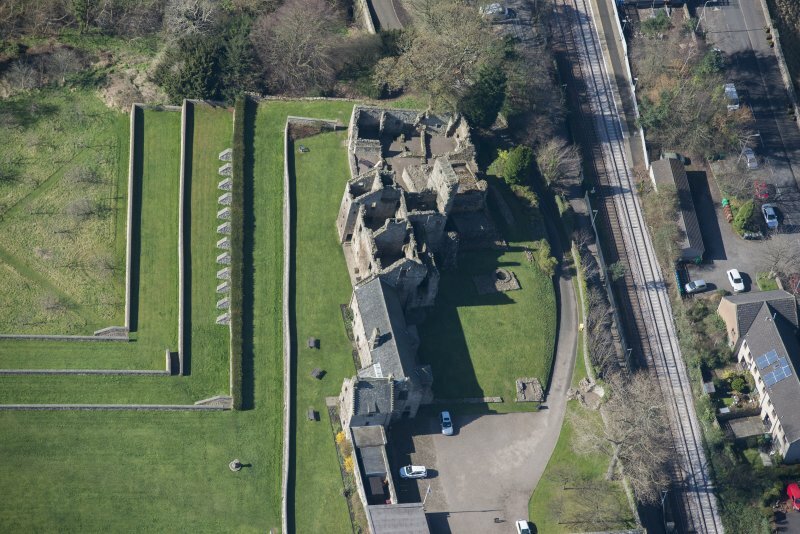 Aberdour Castle presents a complex of buildings and gardens representing four distinct building periods dating from about the 13th century to the 17th century. 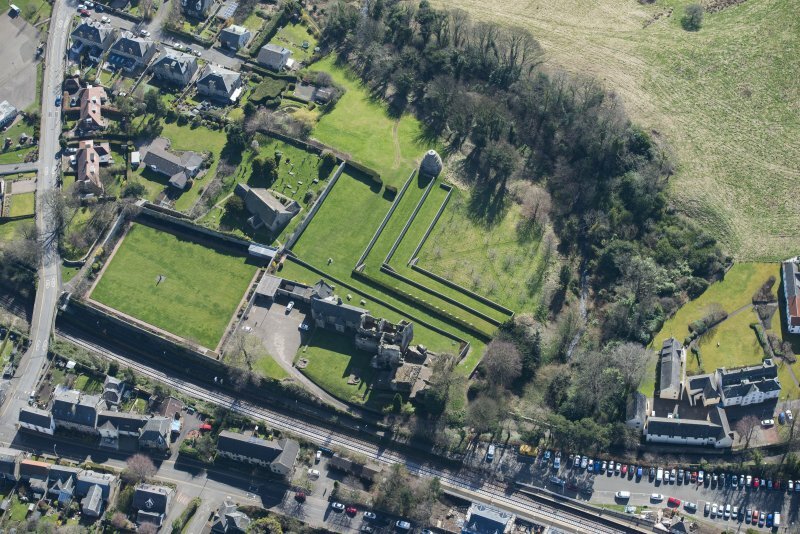 This complex has been constructed on the site of an earlier castle which formed the capital messuage of the Barony of Aberdour granted by Robert Bruce to his nephew, Thomas Randolph, Earl of Moray, about 1325. 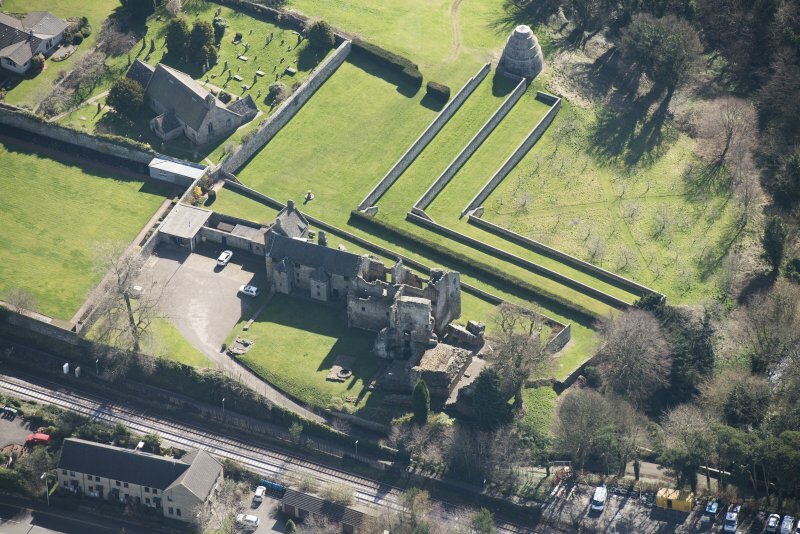 The Morays granted a charter of the barony to William Douglas, Knight, in 1342 and the property has remained in the possession of successive branches of the Douglas family ever since. 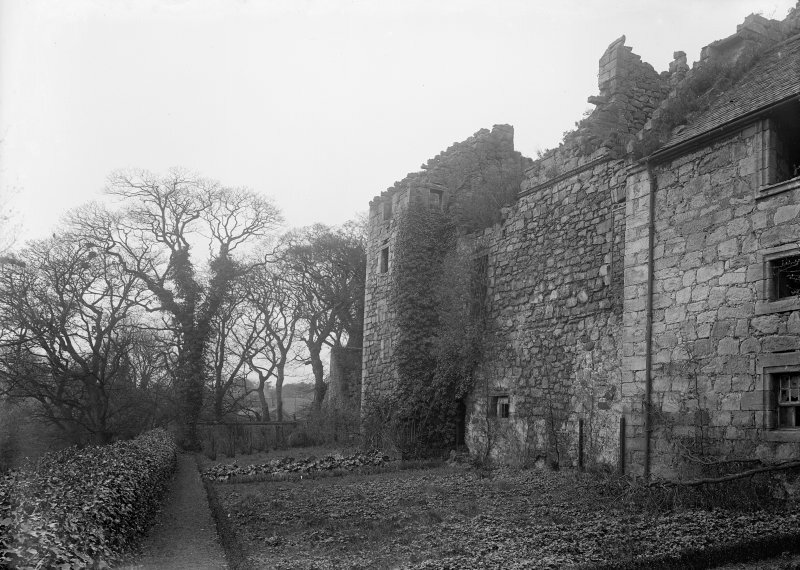 In 1386 the baronies of Aberdour and Dalkeith were united into a single barony of regality known as the Regality of Dalkeith, an arrangement which lasted until 1642. 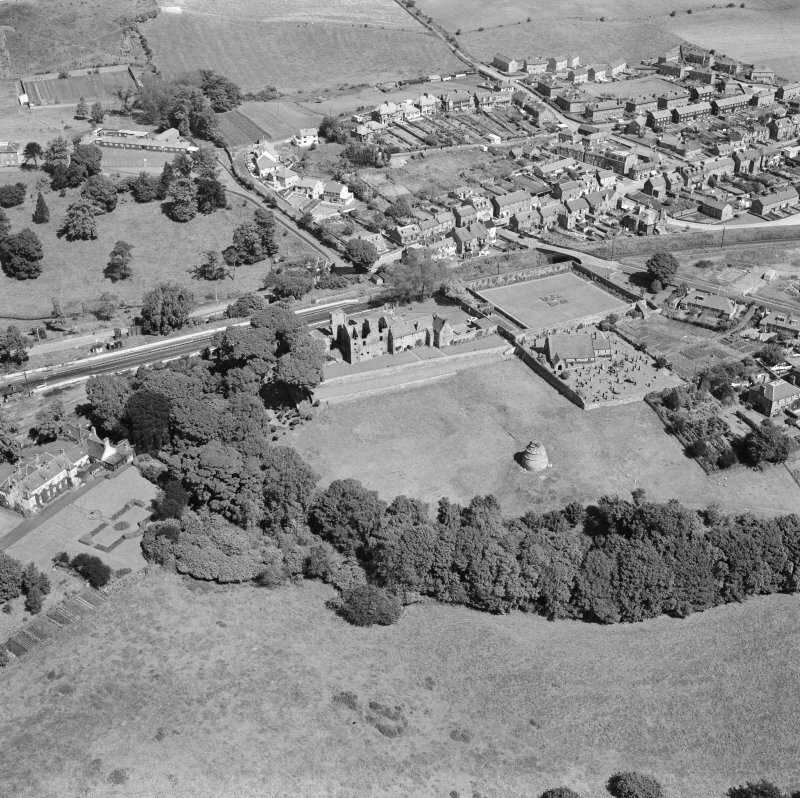 The site of the castle was originally one of considerable strength but this has been diminished at various times. 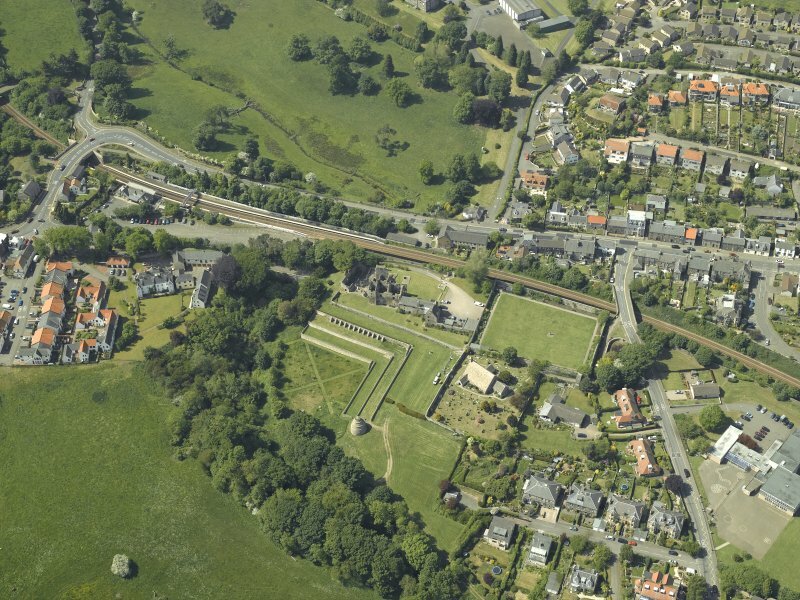 The construction of the garden terraces to the south of the castle in the 17th century and the construction of the railway embankment on the north side in the 19th century were the two most influential factors in changing the site. 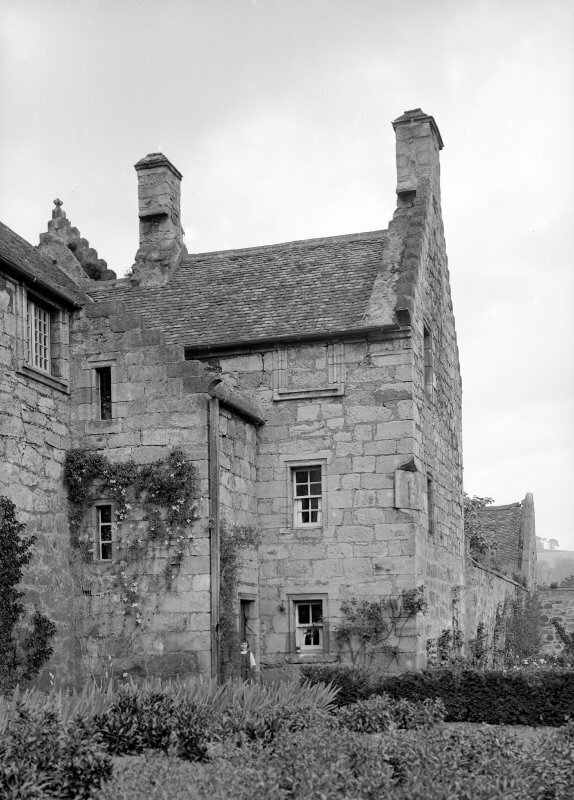 Various other alterations have taken place over the years to make the building more domestic in character, particularly the reduction of the inner courtyard wall to its foundations. 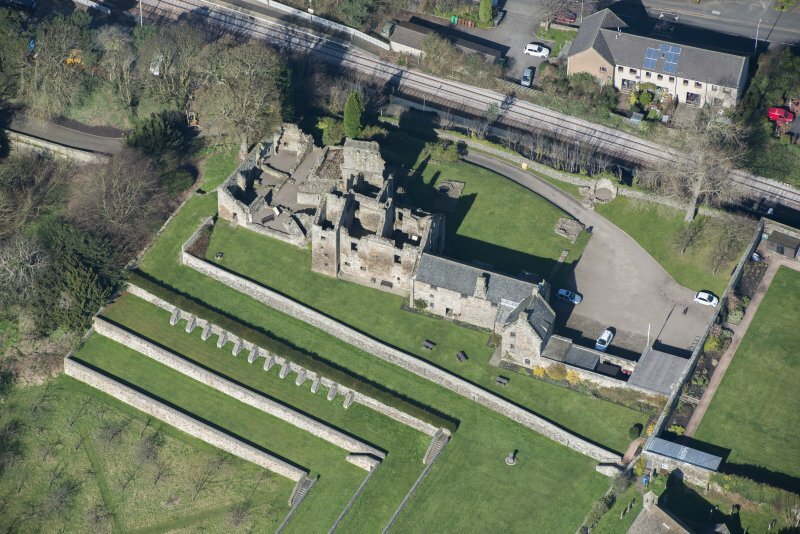 When viewed as a whole the castle expresses this long process of alteration and expansion. 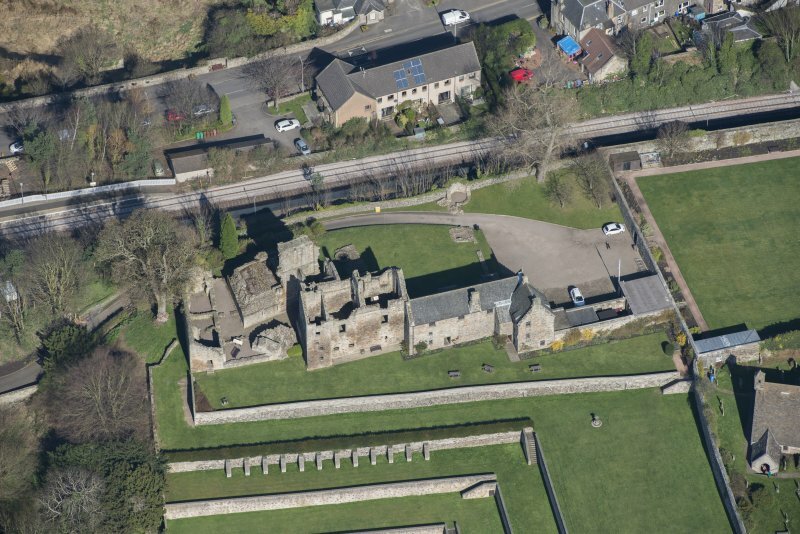 The oldest part of the castle is the tower which forms the west range of the present layout. 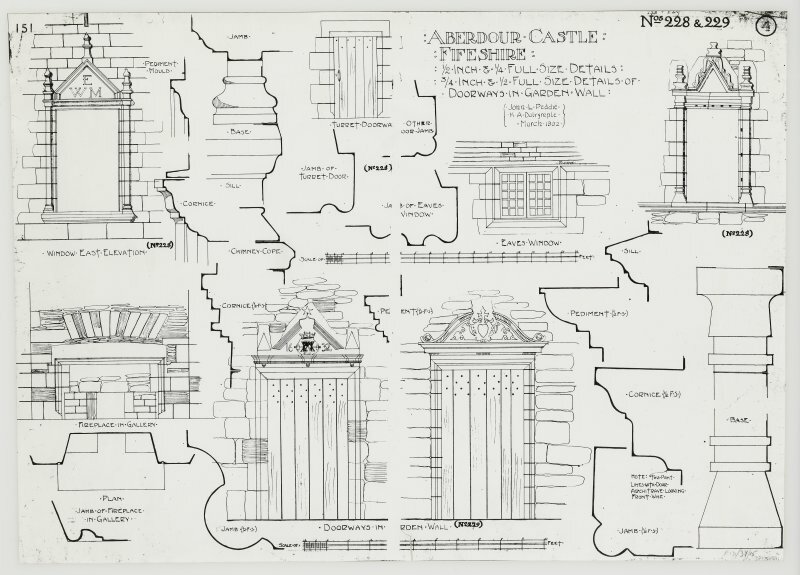 The plan-form of this tower is a parallelogram measuring approximately 16m by 11m overall. The walls are finished with flat clasped buttresses at the north and east corners. 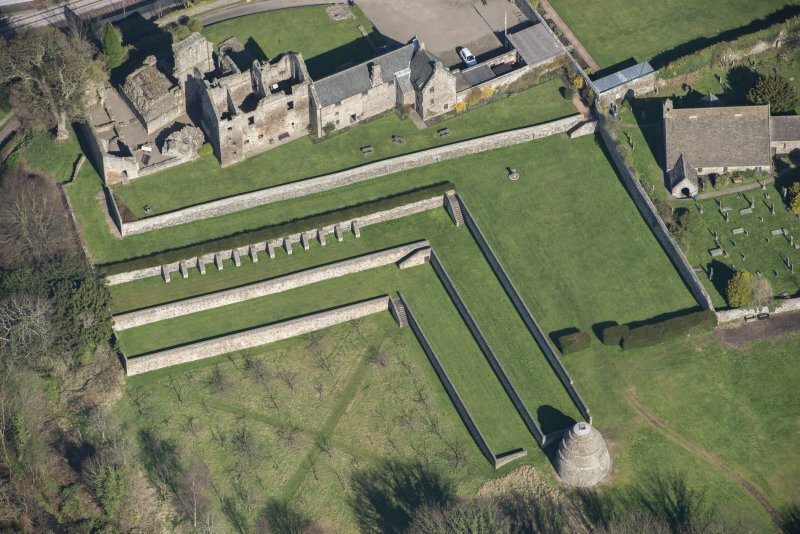 The foundation is stepped except for part of the south-east wall which is built on a splayed base course. The walls are 1.8m thick. 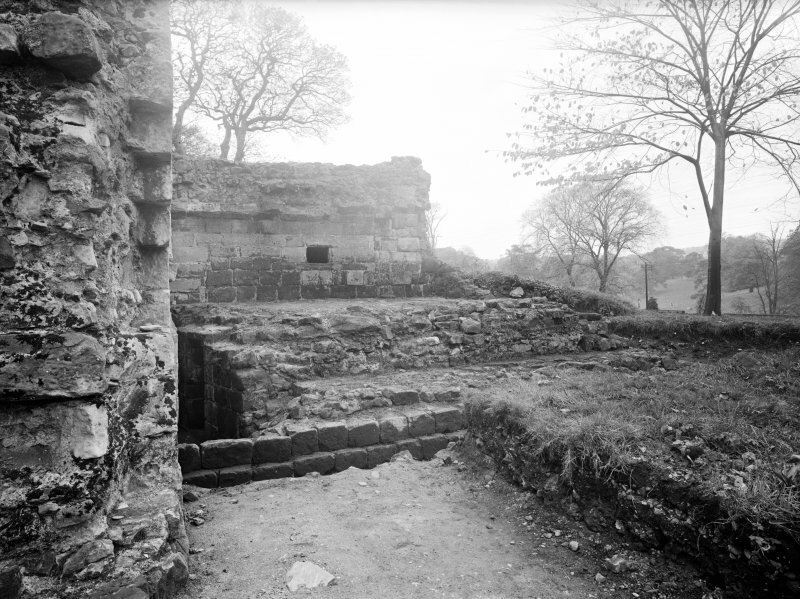 These remains and some internal fragments suggest that this formed an exceptionally early free-standing tower-house. The angle buttresses, splayed base course and cubical masonry are characteristric of 12th century structures and the double lancet window at fIrst-floor level is typical of 13th century work. 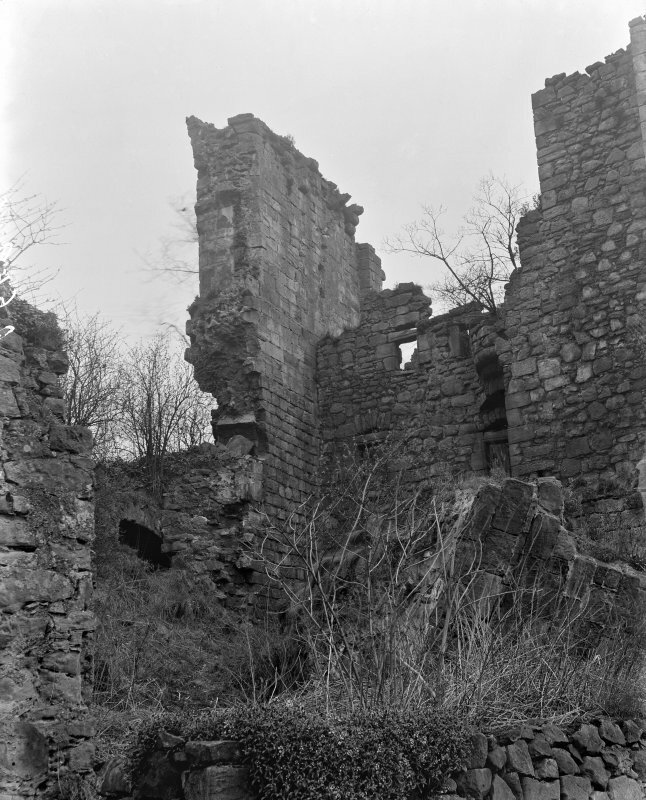 Rebuilding of the upper part of the tower probably took place in the 15th century. 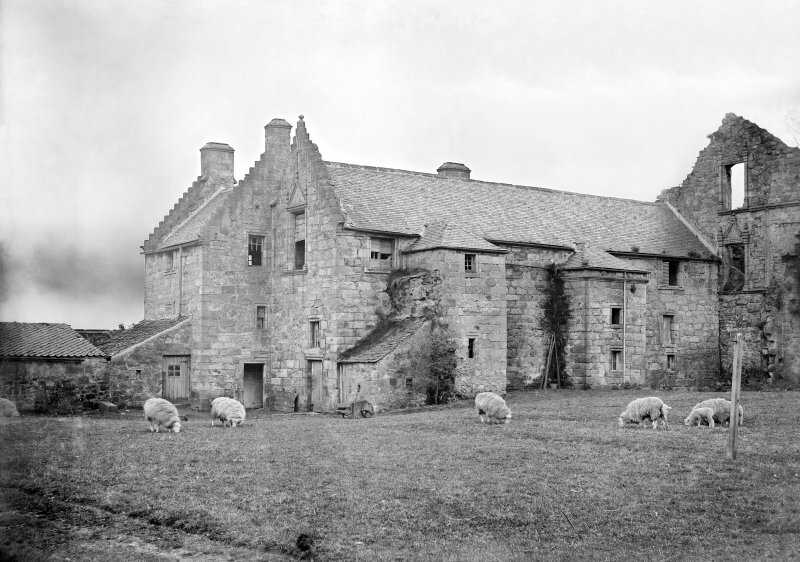 The accommodation provided in the reconstructed tower, although adequate when built, was less than adequate for the requirements of a 16th century laird's household and a new range was added to the south-east This forms the central range of the present layout and is roughly rectangular on plan with a projecting stair at the south corner. The new building is linked to the old by a stair which serves them both at all principal levels. 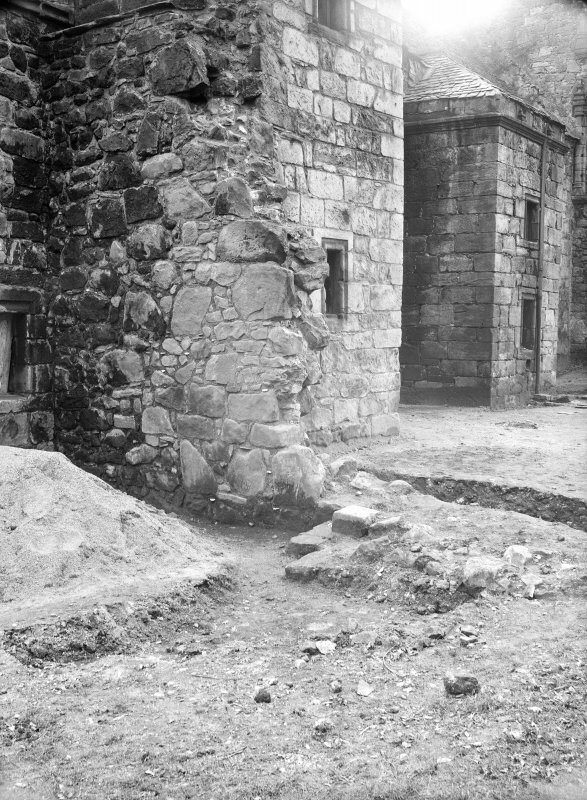 Internally the accommodation comprises two rooms per floor connected by a passage along the north side. On the ground floor the vaulted kitchen contains a large arched fIreplace into which an oven was inserted in 1674. 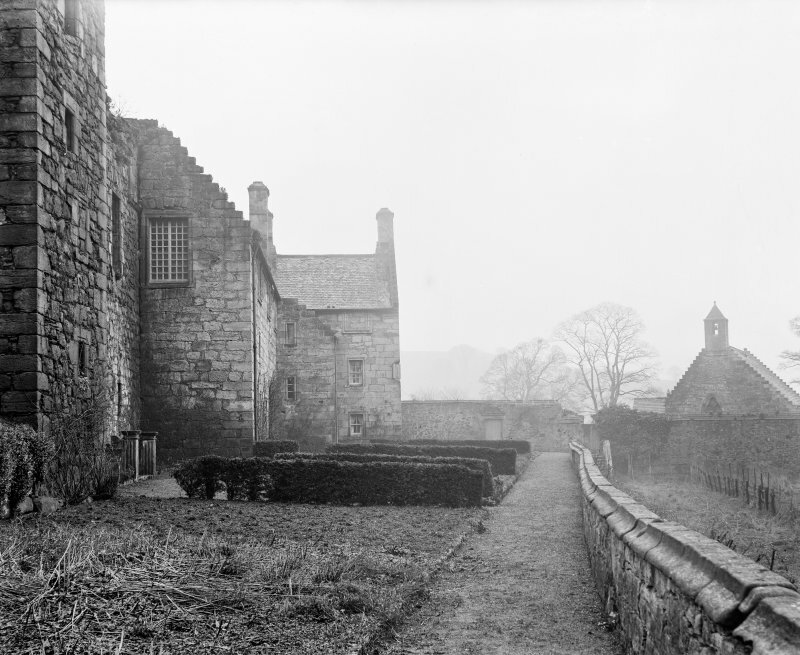 East and west of the castle are courtyards which were added in the 16th century but which may reflect an earlier layout repeated on a larger scale. 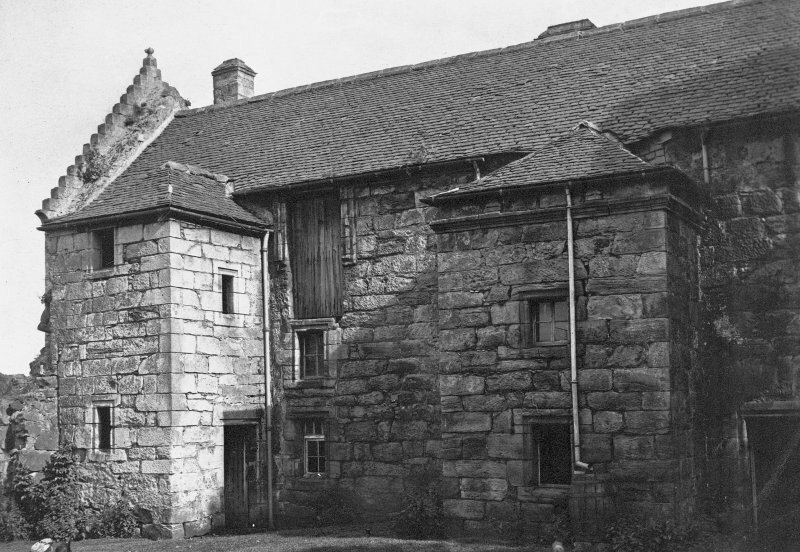 In the west courtyard is a range of outbuildings built against the courtyard walL including a brewery and bakehouse with two large ovens. 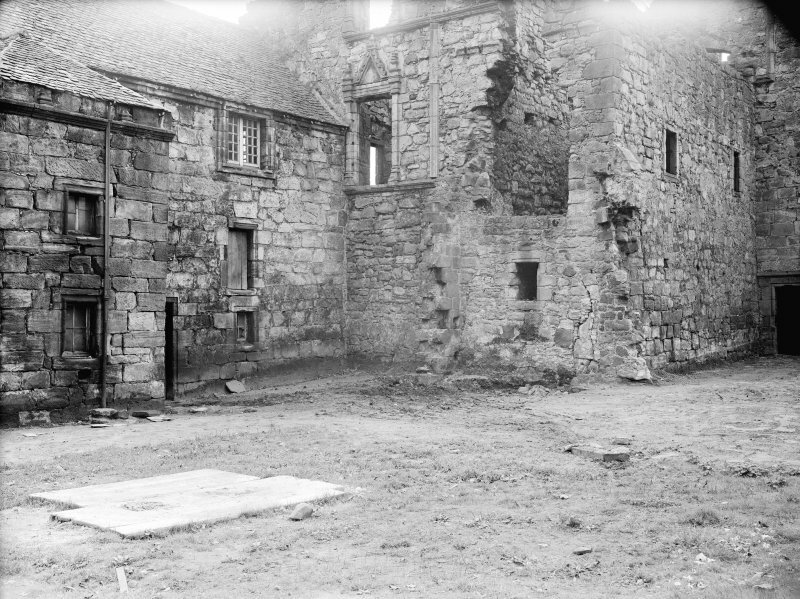 The east courtyard contains a well house which may also have served as a laundry. 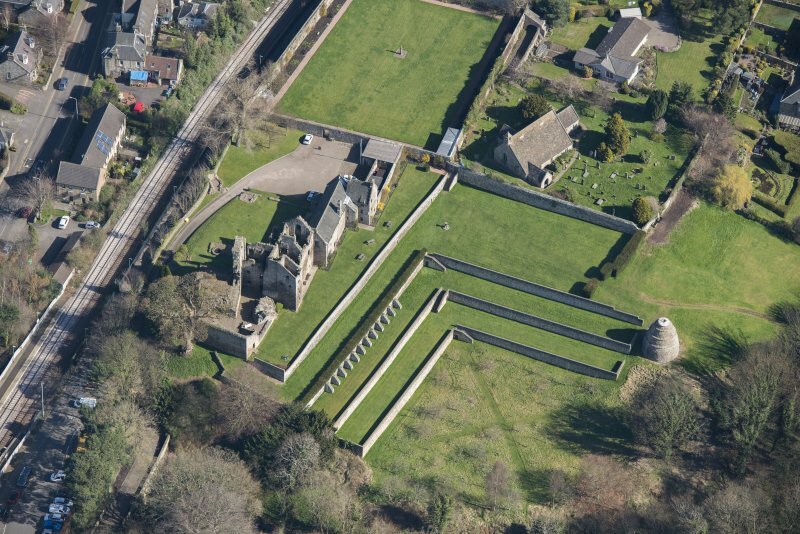 The existing east range was added to the north-east of the 16th century building by Earl William Morton who succeeded to the title in 1606 and died in 1648. This extension is L-shaped on plan with a projecting wing at the south corner and the principal stair in the re-entrant angle. 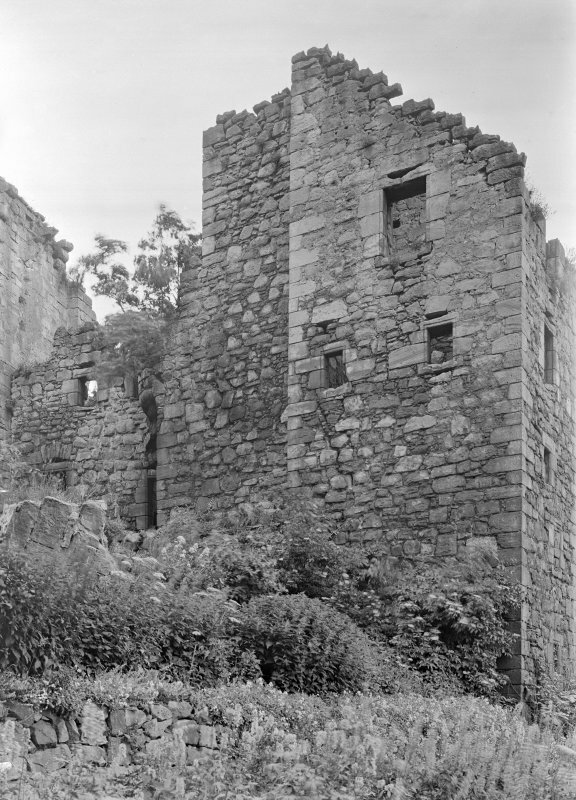 One of the two small towers projecting from the north front is original, the other an early addition. 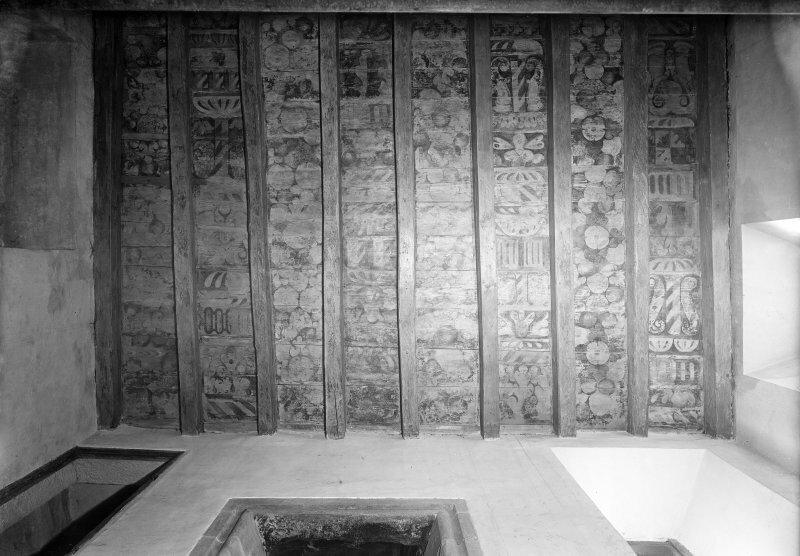 The whole of the first floor of this range formed a picture gallery and it is possible that the ceilings were painted in tempera, as was popular in Scotland in the early 17th century. Certainly the entresol has such a ceiling. 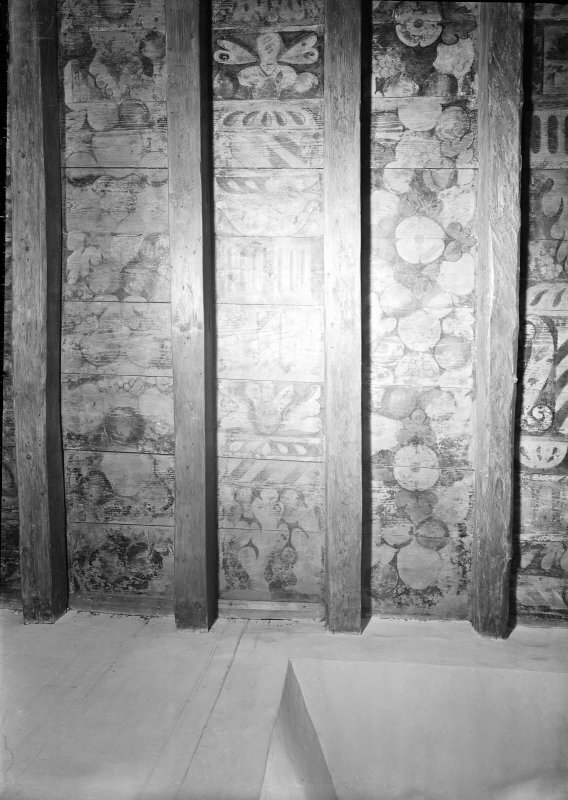 The walls were panelled in timber. 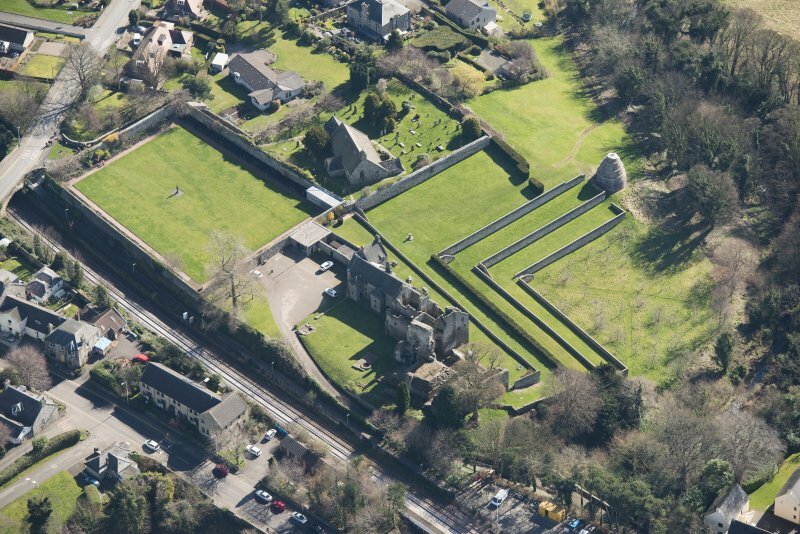 The gardens are situated to the east and south of the castle. 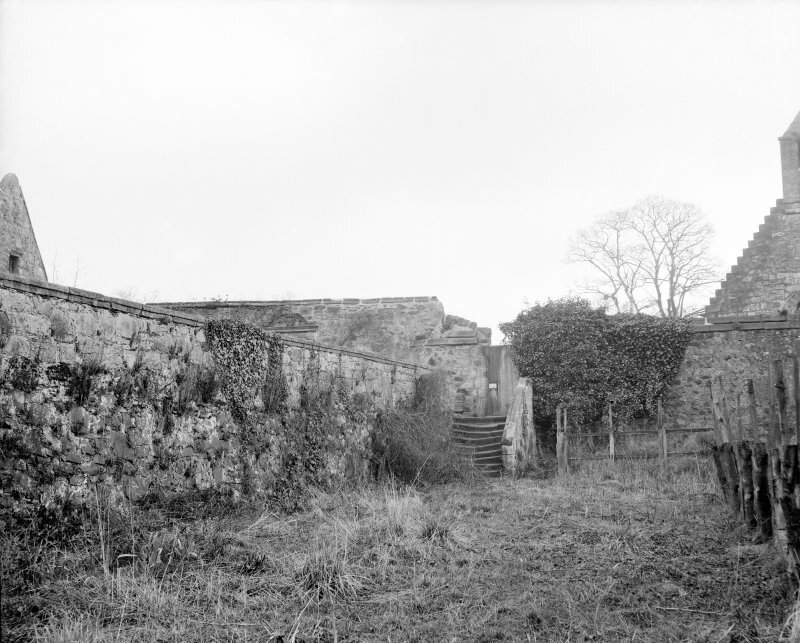 The east walled garden encloses half a hectare within walls 3.7m high in characteristic 17th century style, with enriched pediments on the two gateways, one with the Douglas heart and the other with the date 1632 and the monogram ofWilliam, Earl of Morton and his wife Countess Anne. 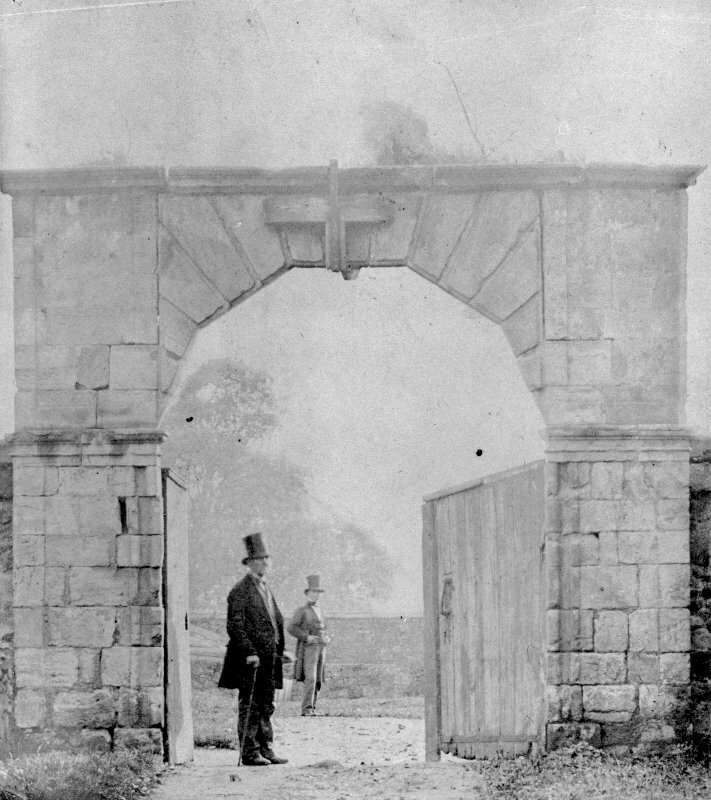 The courtyard gate was inserted in 1740. 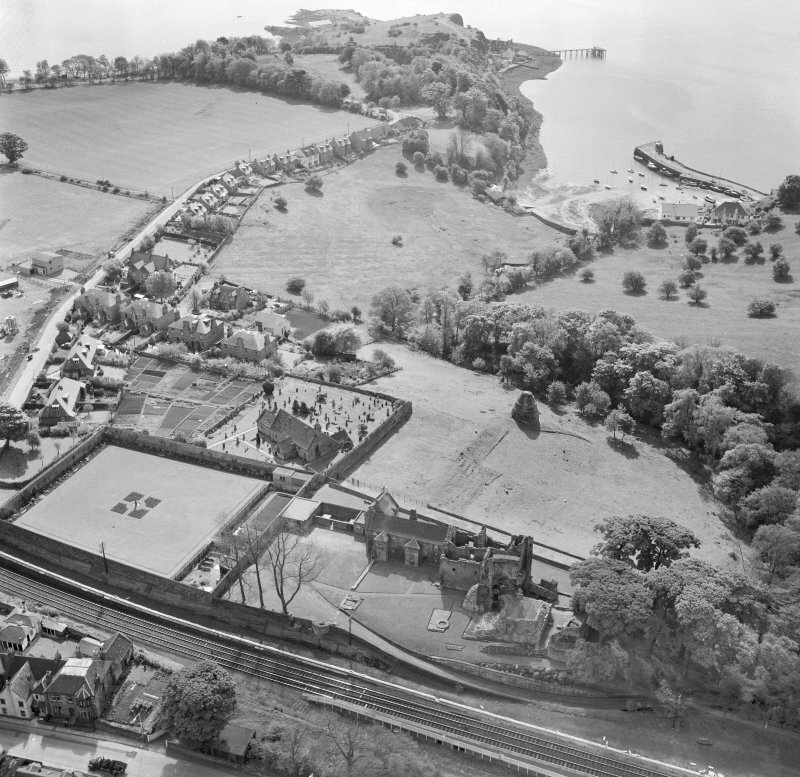 The garden also contained a summer house and bridge to the kitchen garden but only slight evidence of these features survives. 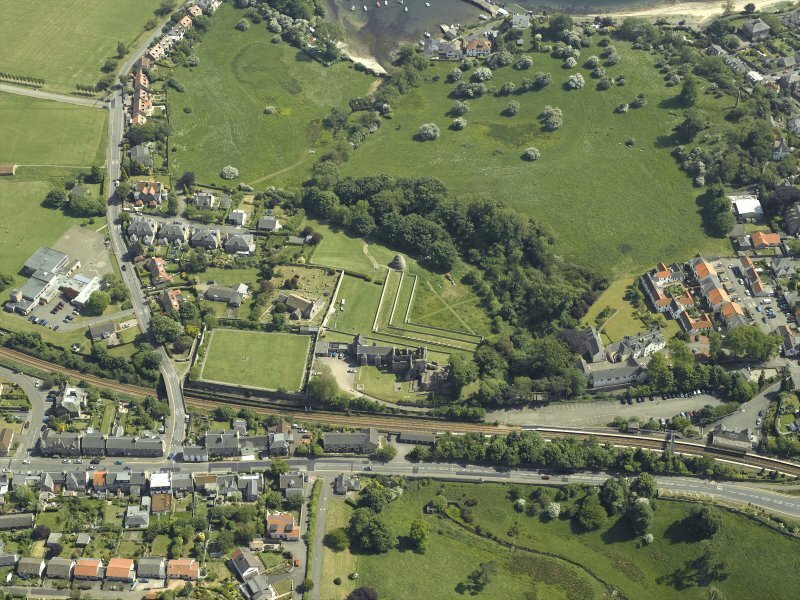 To the south of the castle are two terraces, all that remain of the four terraces existing in 1745. 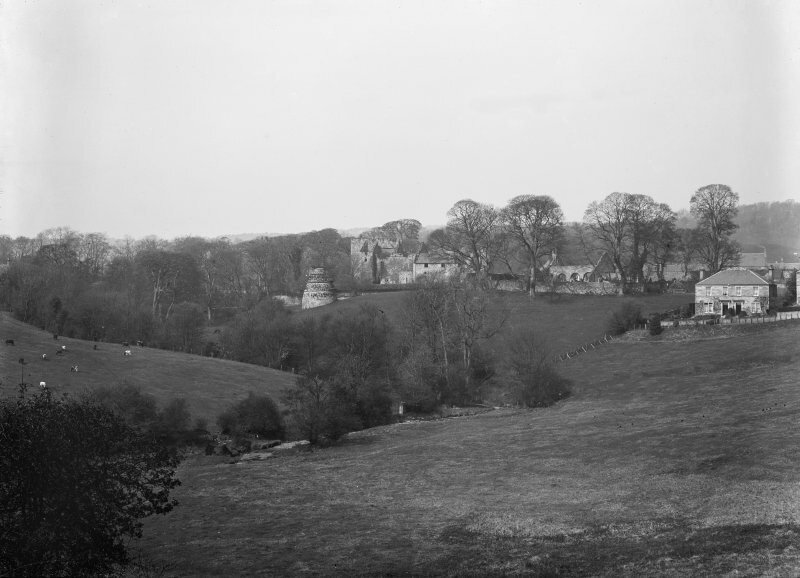 Beyond them is a large beehive-shaped dpvecote containing about 600 nests and the remains of a potence. 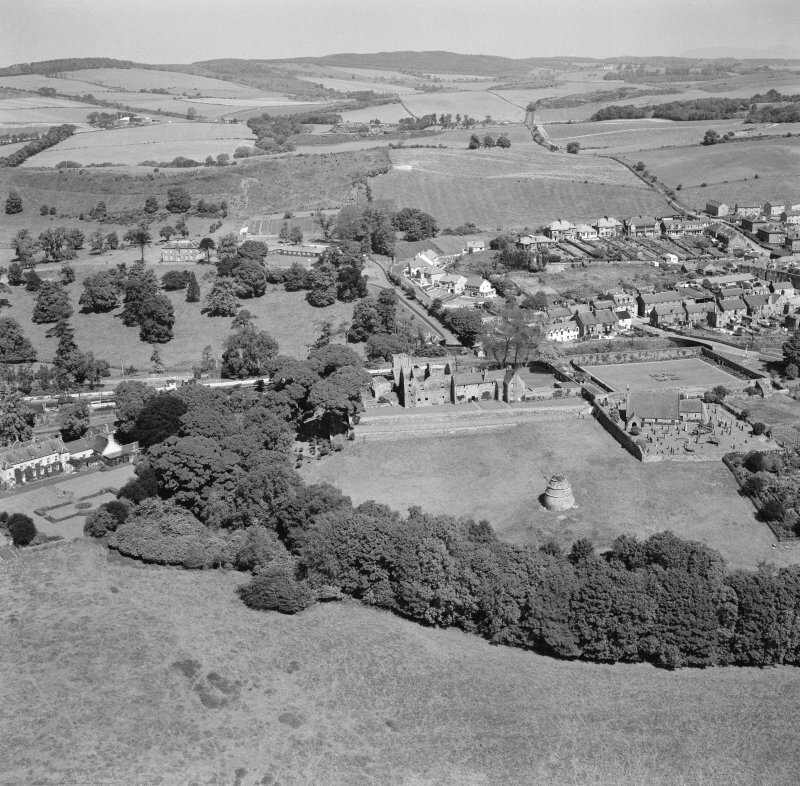 Beyond the dovecote was the orchard or 'wilderness' situated on land that was drained and laid out in 1690. 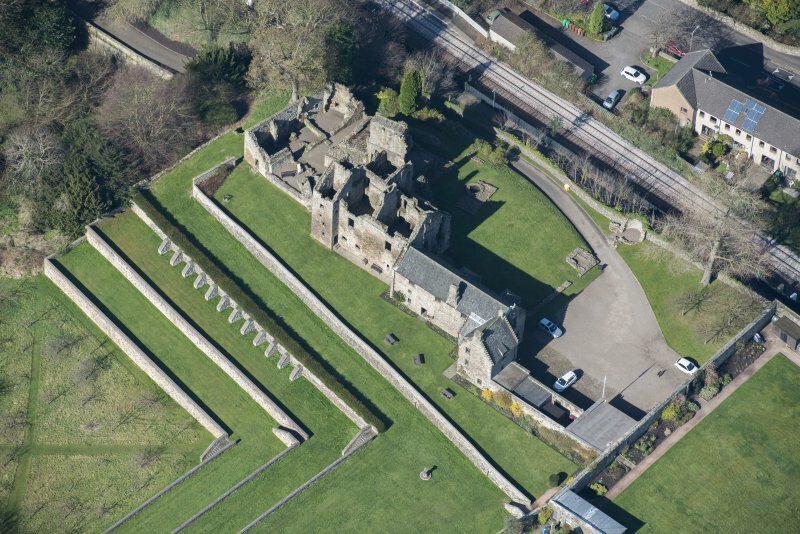 NT 1910 8537 and NT 1923 8545 A watching brief was carried out on 7 September 2011 during the excavation of two small trenches in advance of the installation of new signs at Aberdour Castle. The first, near the entrance gate (NT 1910 8537), revealed whin dust, suggesting recently laid turf. 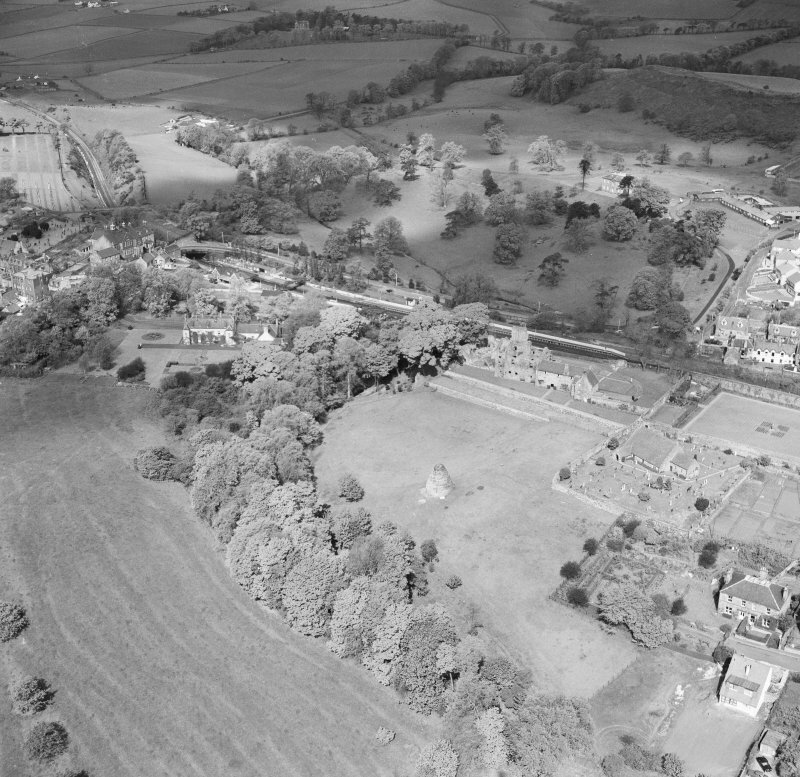 The second, just SW of the Castle (NT 1923 8545), was on the site of an existing display board, but a mortar-rich layer at the lower limit of excavation may represent an undisturbed horizon.